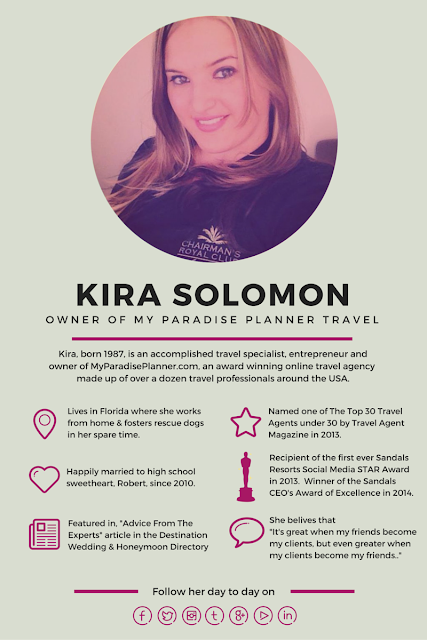 Many of you already know that I am a travel agent who specializes in Sandals Resorts and Beaches Resorts and is one of their top award winning agent partners in the world. I have had the honor and opportunity to visit all of the properties, therefore going into this trip I knew I was going to be comparing Sandals Royal Barbados to each of them all week. I had expected that. But what I hadn't expected was how unique and incomparable this resort is. While it has moments where it reminds me a lot of other Sandals (and Beaches) properties, this resort is in a league of it's own. My husband and I had stayed at Sandals Barbados two years prior, while the construction was just beginning on the Royal resort next door. We'd fallen in love with the property and thought it couldn't get much better, but, boy, were we wrong about that. Arriving at the airport is an experience. 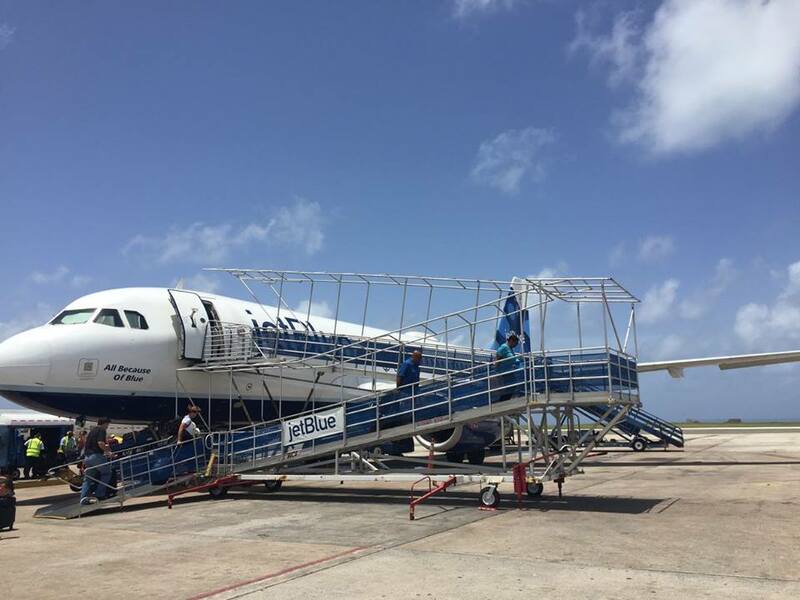 If you're used to arriving at an airport where you walk off the plane through a jet bridge, this will be a bit different. Everyone deplanes onto the actual runway and walks down a ramp from the plane to the tarmac where they then walk into the terminal. Keep this in mind if you plan to bring a heavy carry on that you don't want to lug around. Once inside, there is customs and immigration, which depending on the time of your arrival could be a quick process, or a very slow one. In our case, we were the only plane arriving at 7pm in the evening, but because of an error with our flight attendant saying we only needed one Immigration & Customs form per family when we really needed one per person, everyone in line ended up having to stand around filling out more forms and it slowed us all down. My recommendation to help speed up the process would be to pre-purchase the VIP Fast Track service available in Barbados. It currently costs $59.99 per person on arrival (subject to change at any time) and this isn't offered through Sandals but a separate company, so talk to your travel agent how to book that. It's well worth the money, especially if you're coming in at a time when several other planes are landing and you don't want to be stuck in a long line. I've heard some people arriving at peak travel times are standing in lines that go out the door which could be a wait of 1 hour or more. The VIP Fast Track service has an arrival option where someone with a sign with your name on it will be waiting for you when you walk into the airport. They'll whisk you away to the priority lane where there is little to no wait and you'll be through and picking up your bags in no time. 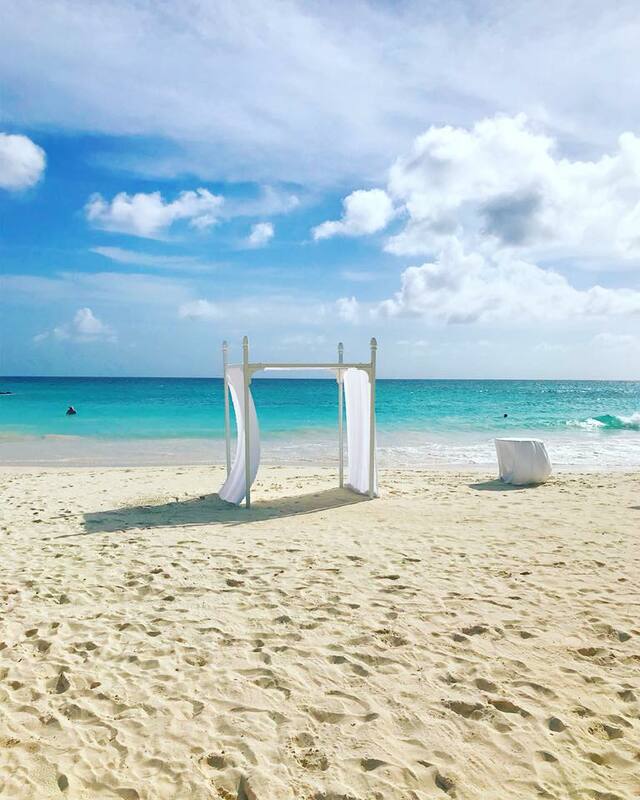 Once you're through Immigration, have your checked bags in hand and clear Customs, you'll be on your way to the Sandals desk. Just a brief note while we're discussing Customs, if you have a drone you plan on bringing... don't. 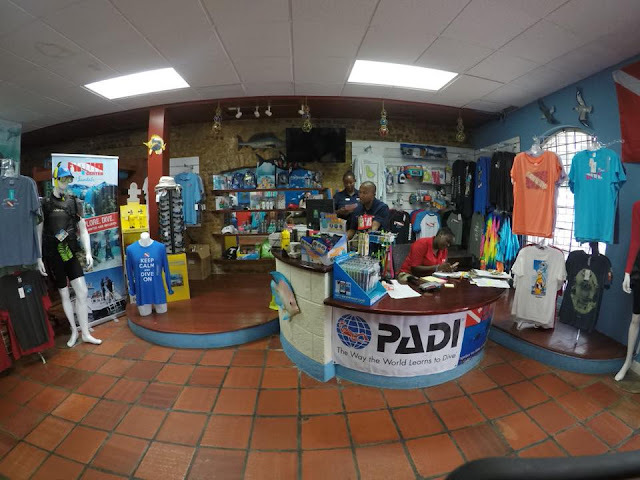 :( There is a law in Barbados banning visitors from bringing drones and they will confiscate it at Customs and hold it until you return to the airport to fly home. Save space in your suit case and leave it at home for this trip. After you've exited the doors after Customs, you'll see someone holding a Sandals sign. 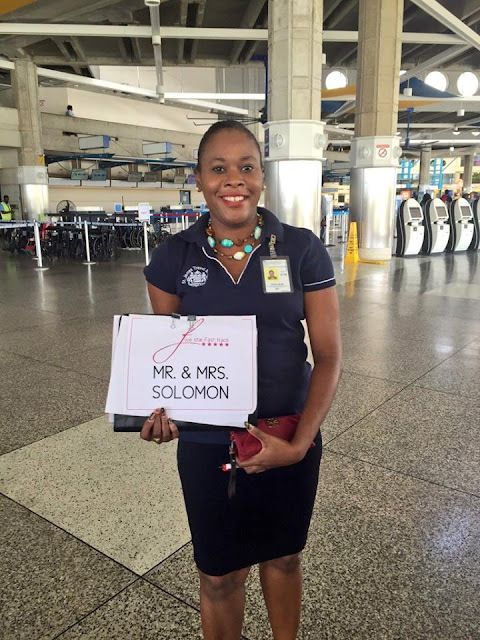 They will show you to the Sandals desk outside of the airport where someone will check to make sure you're on the arrival list and will put you in a transfer to the resort. It isn't a long wait, but there aren't chairs, so if you're doing the fast track and you're out before others and the van isn't right there waiting, you may be standing for a few minutes. The company that runs the transfers for Sandals tries to make it so guests aren't waiting longer than 20 minutes to leave, but if you truly want the full VIP experience, consider a private transfer for an additional fee, or upgrade to one of the butler rooms that offer complimentary private Rolls Royce transfers (I'll touch on that in a few). As soon as we were whisked away to the resort it was a quick 15-20 minute drive by van transfer. Our JetBlue flight from Fort Lauderdale got in pretty late so it was already dark by the time we pulled up. But the resort still looked beautiful and the staff still greeted us with cold scented towels, a welcome cocktail, and their very own "welcome home" song. The lobby is very bright and welcoming both in the morning and in the evening. Though I will say, I love the Sandals Barbados lobby more - with the cool water fountain and fire feature in the middle of the check-in area. But Sandals Royal Barbados looked very elegant and exclusive. 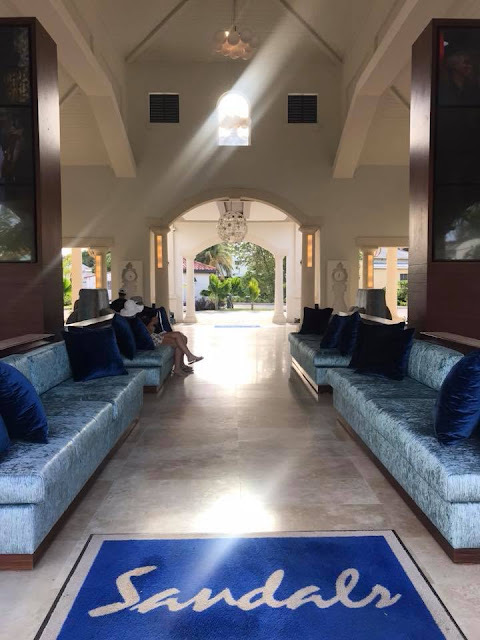 I have a photo of the lobby during the day time and you can get a bit of an idea from that. 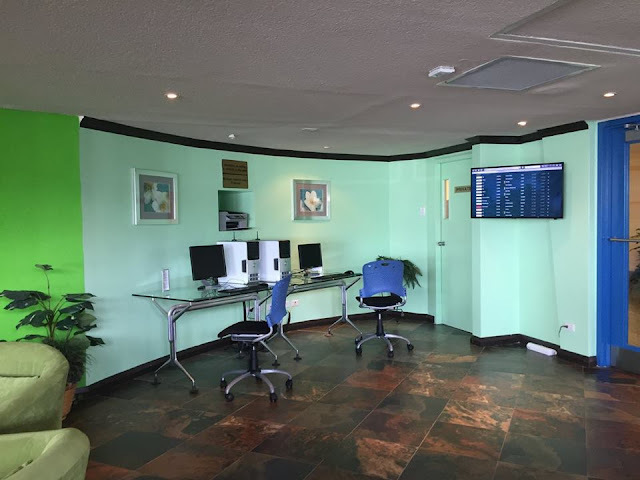 Check-in is the same as it is at every Sandals property. You're handed an iPad and you fill in basic information such as dates of birth, address, returning flight information, etc. It takes about 5-10 minutes to fill out depending on how tech savvy you are. If you're arriving before 3pm, there is a chance your room may not be ready yet. 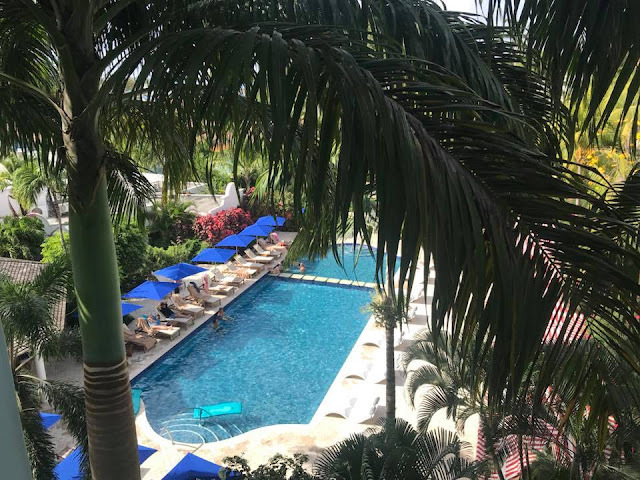 The official check-in time is by 3pm, so if your room isn't ready before then, you can have them hold your bags for you and can enjoy the resort facilities. There is a bathroom right off of the lobby where you can change into your swim suits if you want to enjoy the pool or beach while you wait. If you leave an go enjoy the resort then you would just want to check back by 3pm to get your room key. 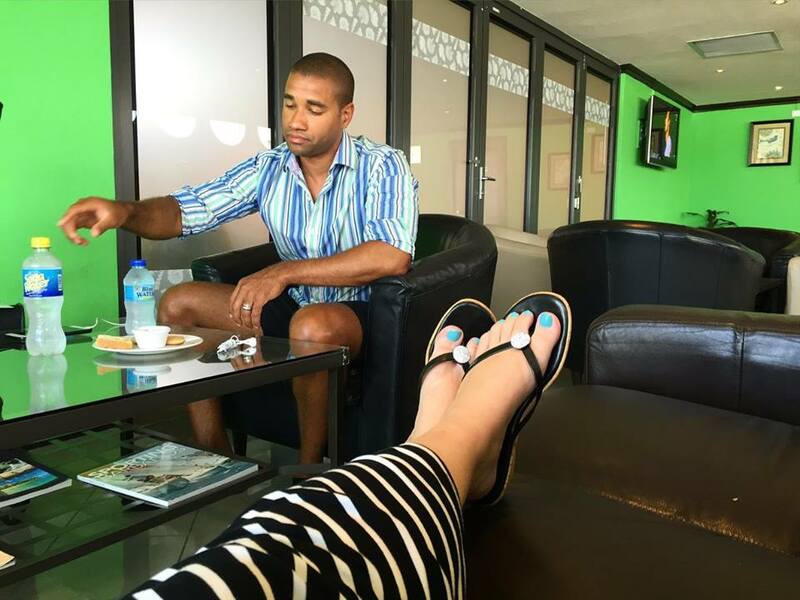 Sandals will bring your bags to your room for you so you don't have to do anything but get you key and go to your room. They will send a staff member to the room with you so you know where to go, and they'll give you a bit of a resort tour along the way. If you're lucky enough to be in some of the top butler suite room categories, you're arrival will be a little bit different. First, you'll be whisked away from the airport in a luxury Rolls Royce at no extra cost to you. One of the Rolls Royce vehicles waiting to head out for a pick up. 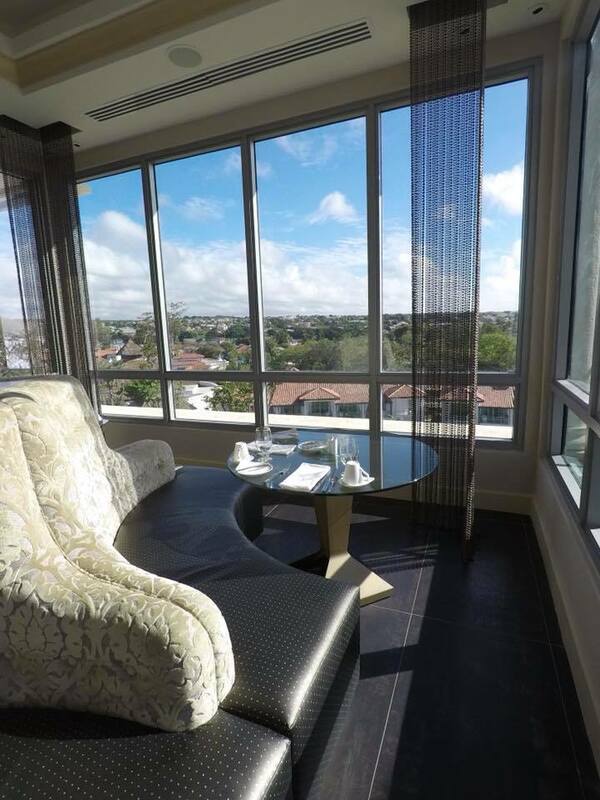 Then you'll be escorted into the private butler lounge, accessible only to butler guests. In that lounge you will meet one of your butlers and either check-in there or they will bring you to your room if it is ready and you will check-in inside your room. Snack, drink, and entertainment options for guests sitting in the lounge. 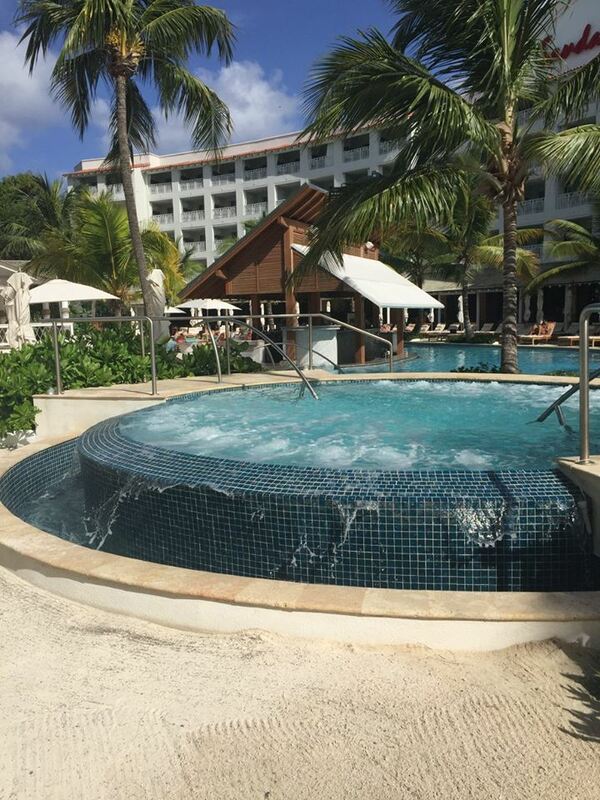 There are so many reasons to book a butler suite at Sandals but this is one of the many perks. 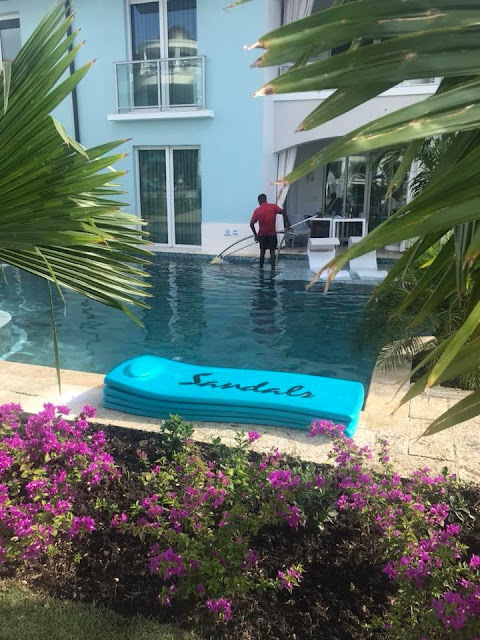 If you're considering a Butler room but aren't entirely sold on it, check out my other blog post Is the Butler Service At Sandals Worth It? and hopefully that will help break it all down for you. But of course, I'll go over some other examples in this blog, too. 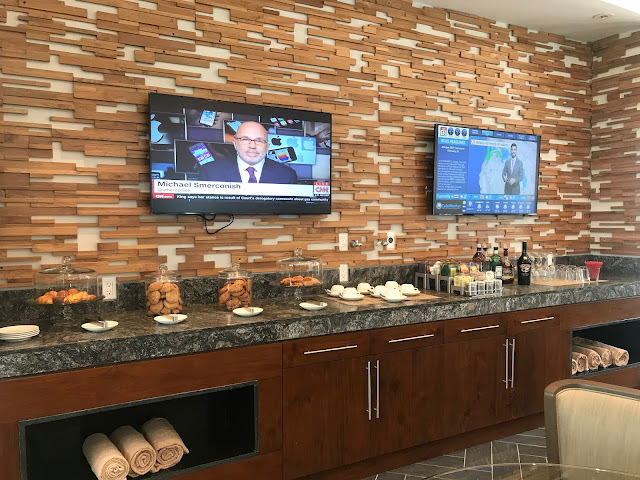 The room is Club level, so we received the typical Club level amenities. We had in-room liquor which included William Lawson Whiskey, Appleton Rum, Old Tom Gin, Kirov Vodka, and Robert Mondovi Cabernet which were on the bar, and in the mini-fridge was Robert Mondovi Chardonay and Banks Beer (the local beer in Barbados) as well as various sodas, water bottles, and juices. We also had two robes in our closet, as part of the Club level amenities, as well as a Room Service menu. 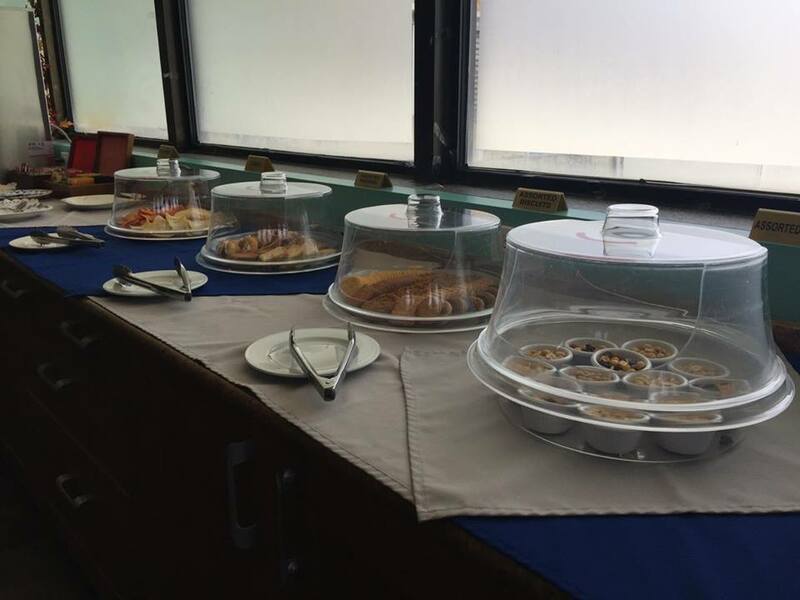 At the time we traveled, just a month into the opening, room service was just being rolled out for Club level guests there. 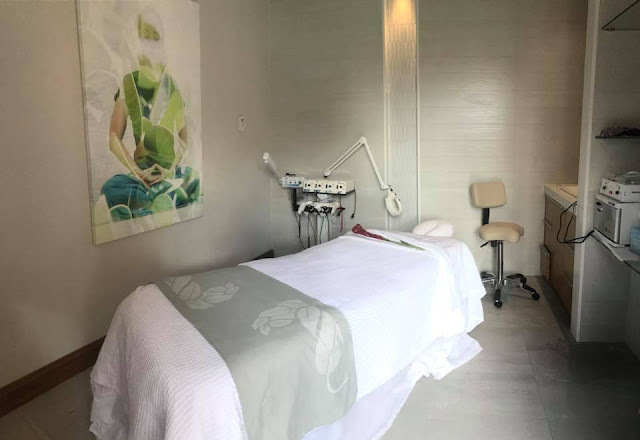 Before that, it wasn't fully ready to be offered so the resort was giving spa credits, island routes credits, and other extra amenities to make up for it. By the time we got into our room it was around 9pm and we were pretty exhausted from a whole day of travel after being up since 4am. So we opted not to go out exploring for dinner and ordered the room service to be delivered to us. Of course, I was so tired and hungry that I forgot to take a photo of the picnic we made on our bed that evening but I had the Chicken Club (normally it's a Turkey Club but that evening they had chicken instead) and my husband had the Veggie Plate, a Fruit Plate, and an order of Fries. My chicken sandwich was great and it came with fries, too (the thin kind like at McDonalds). They included silverware, all the basic condiments (mustard, ketchup, and mayo) and salt and pepper just in case we needed that. Of course, we had drinks already in the room, so we were good to go for a night of dining in. For Club Sandals room service, Breakfast is served from 7am - 11am and then "All Day Dining" for Lunch and Dinner is served from 11am - 10pm. 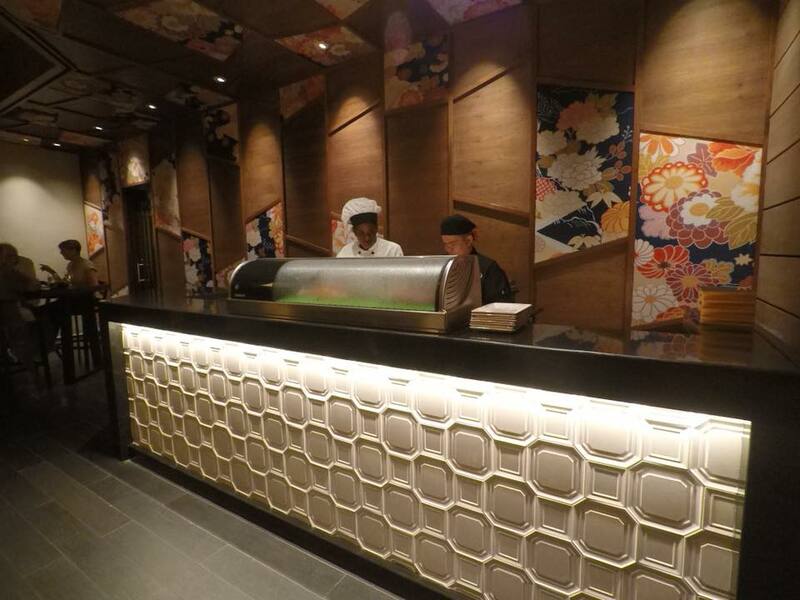 We didn't bother ordering it again the rest of the stay because there were so many great dining options to choose from! 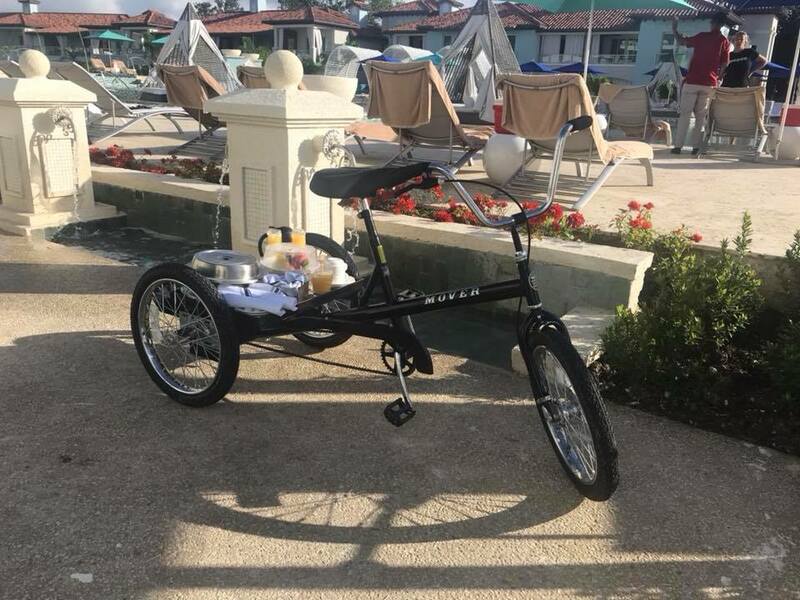 You may see these bicycles around property. They're for room service deliveries. Genius idea if you ask me. You get your food delivered much faster this way. The view from our room was fantastic. We couldn't really see much that evening but when the sun finally came up we were greeted with a beautiful sunrise and the beach and ocean right beyond the main pool area. The swim up suites were beneath us (we were on the 4th floor). 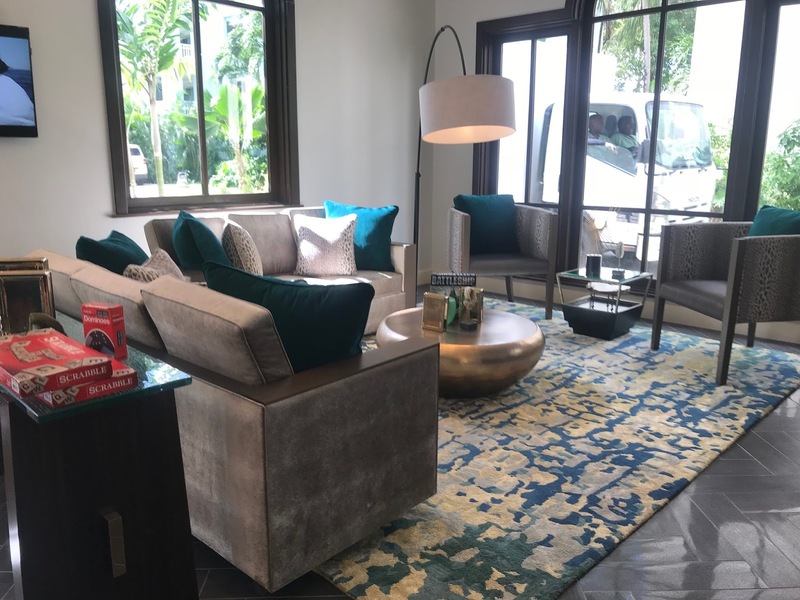 It was the perfect location because it was pretty centrally located to everything we would need to get to. 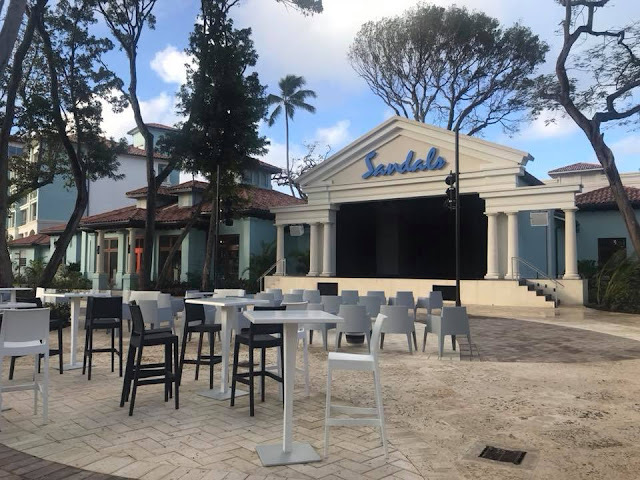 Every time Sandals comes out with a brand new property and I think they've reached their best yet, they surprise me again with an even better resort. They're constantly outdoing themselves and I love to see what they come up with next. 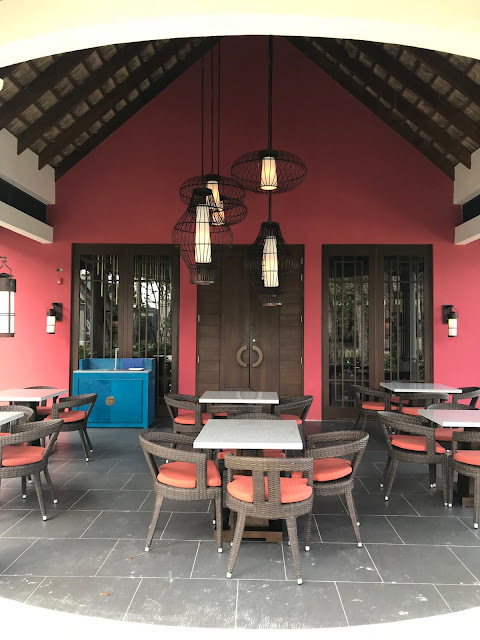 Of course, at Sandals Royal Barbados they have what I honestly believe is their best property yet, and for so many of the reasons I discuss below (amazing room options, brand new dining options, unique new resort amenities, etc). 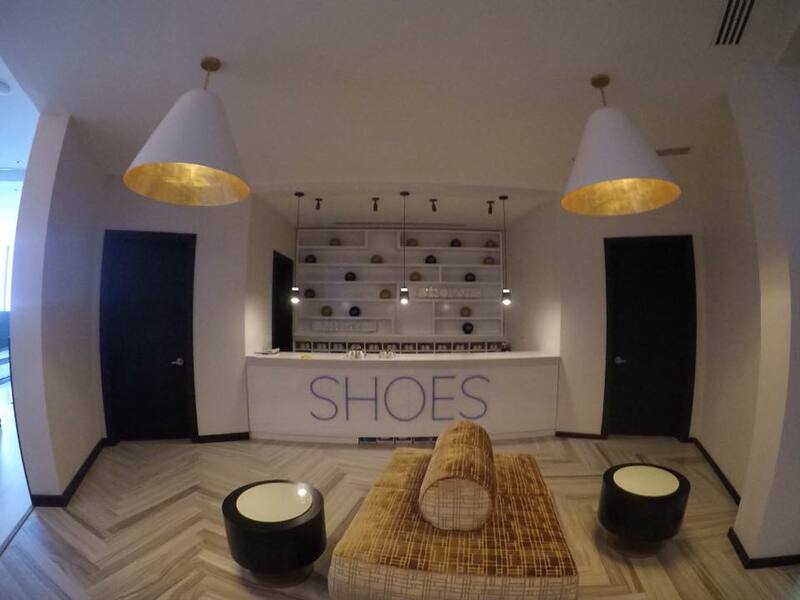 But there are also the same Sandals elements that can be found at all of their resorts. They've become the standard we've expected with our Sandals experience. 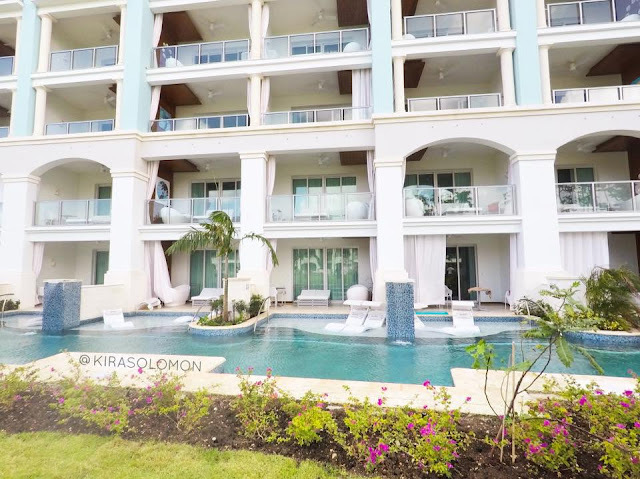 The furnishings, paint colors, and decor are all very much like some of the newer Sandals properties. 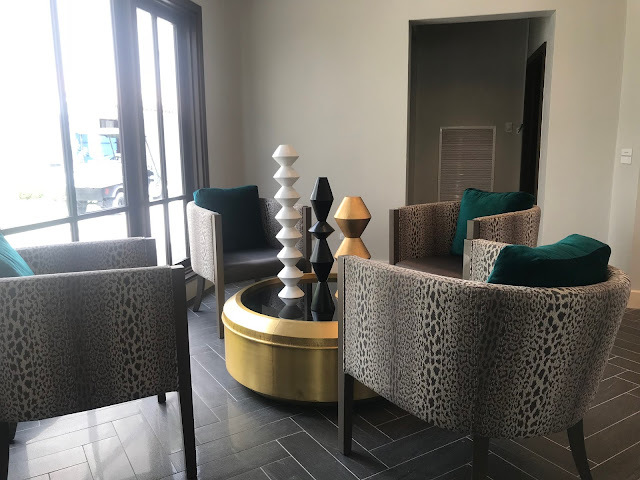 You'll always find things like romantic fire pits spread out around property offering a spot to lounge around in the evenings. You'll always see lush tropical landscaping that is meticulously maintained (I can't smell Night Blooming Jasmine now without thinking about evenings spent at Sandals). Everyone from management to housekeeping will smile and say "hello" when you walk by. Some even stop to ask how your day is going and if they can do anything for you. The staff always works tirelessly in the mornings cleaning the pools, combing the beach, and making sure everything looks pristine for when we all wake up to a new day in paradise. I do enjoy traveling to different Sandals properties to see those similarities. 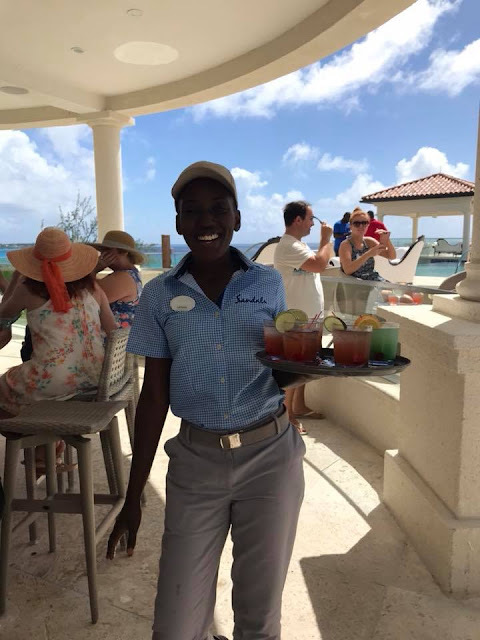 No matter which resort we walk into, even if it's our first time there, it always feels like home because Sandals takes great care in making sure all those little things are consistent across the chain. 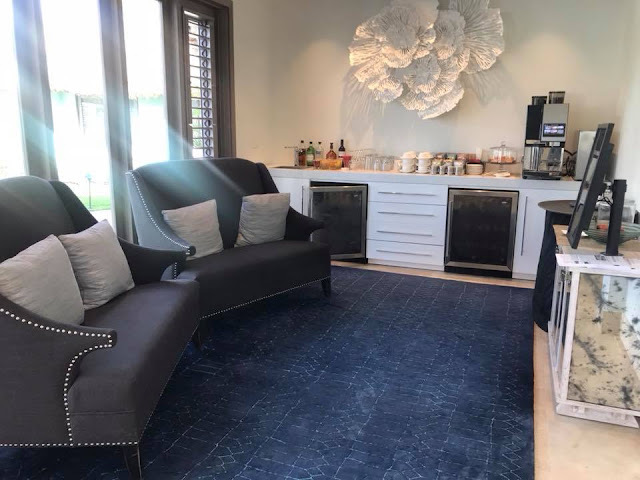 They do an excellent job and honestly, no matter what room you have or view you have, the grounds on property are so beautiful you'll be in awe. We spent a good ten minutes one afternoon just sitting in the lagoon pool watching a vibrant greenish-blue humming bird fly from bush to bush around us having his lunch. I'd never been so close to one and it was breathtaking to watch him go about his business not caring we were watching him the entire time. 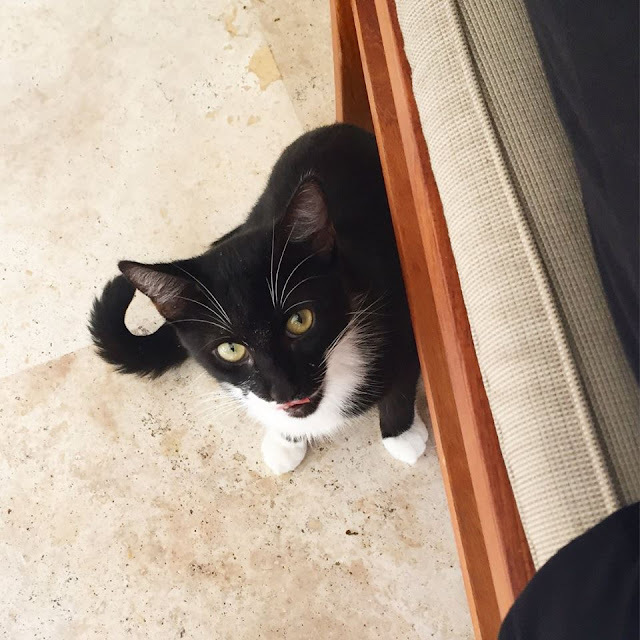 Even the resort cats (something you'll find on pretty much all Sandals properties because of stray cat issues on the islands) are fun to watch. I'm not much of a cat person, only because I am allergic to them, so I don't generally pet them, or if I do I have to wash my hands immediately (which you should do anyway). Sandals takes excellent care of the cats and never once have I ever seen any messes left from them or had any issues with them. They're either friendly or afraid of you, but either way they will keep to themselves unless you invite them over with food or promise of pets. The birds are always far more annoying than the cats ever are. 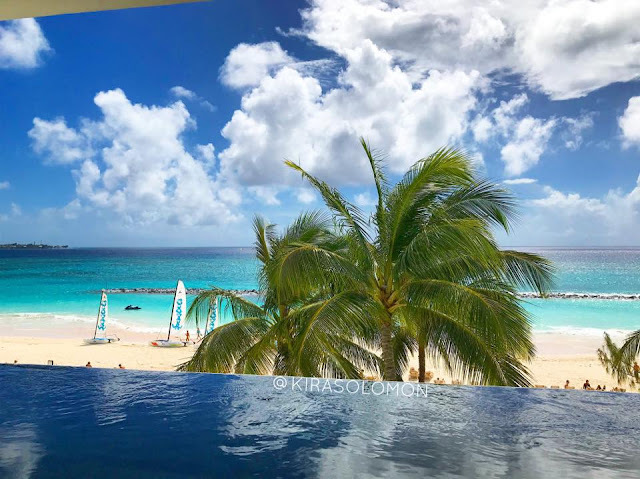 We stayed at both resorts during our stay, three nights at Sandals Royal Barbados and four at Sandals Barbados. The entire time we had no problems freely enjoying both properties. It feels more like one resort with two "villages" as Sandals normally has, verses two separate resorts. As of this trip, I have officially visited and dined at every Sandals Resorts and Beaches Resorts property. 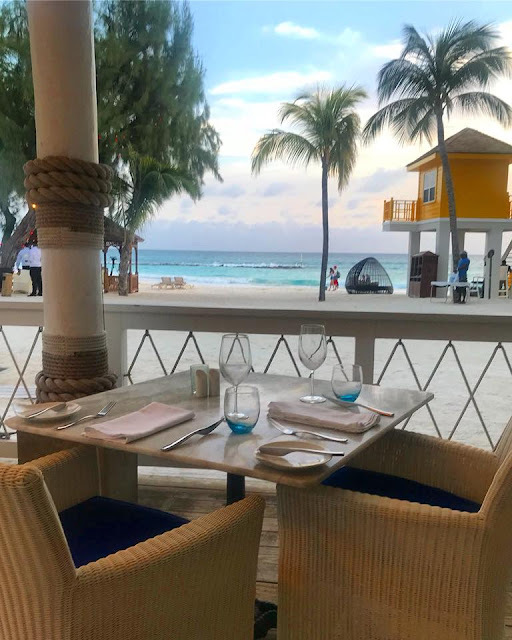 I know most of the resort have very similar restaurants and menus, which is why I really enjoyed staying at Sandals Royal Barbados. 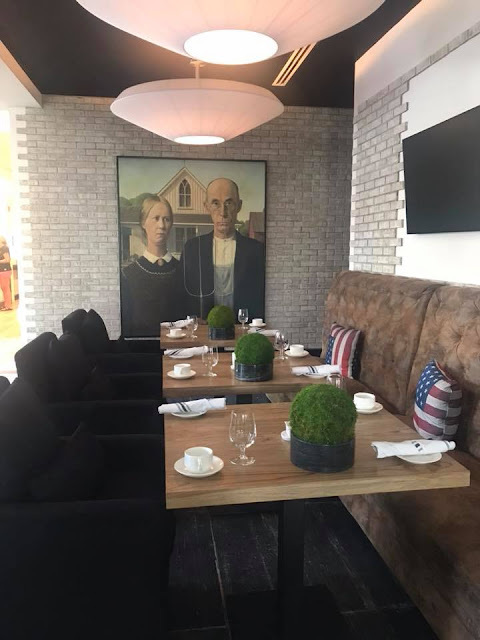 They have a few new restaurants unique to this property. The American Tavern is one of those new restaurants, which is exactly what it sounds like. For breakfast it was very typical of a Sandals breakfast buffet. 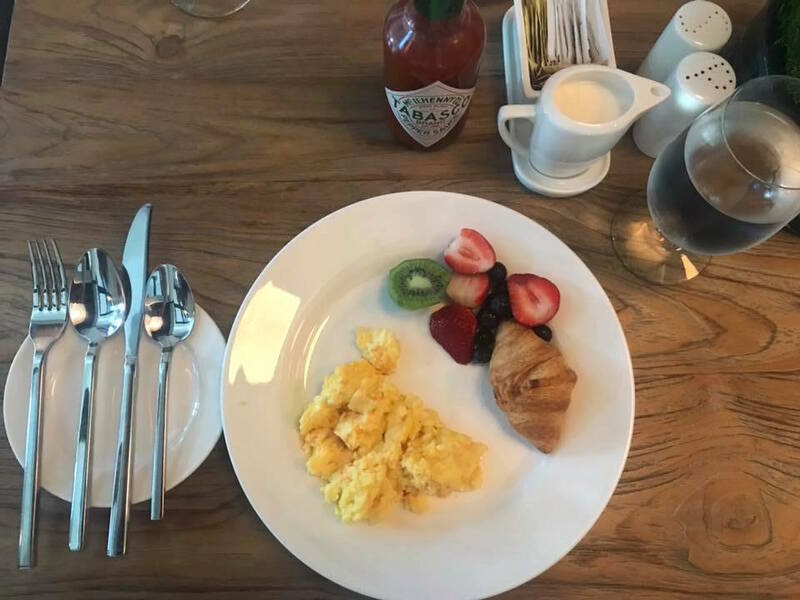 Eggs, potatoes, hot/cooked meats, cold cut meats, cheeses, cereals, fruits, oatmeal, bread and pastries, and an omelet station. 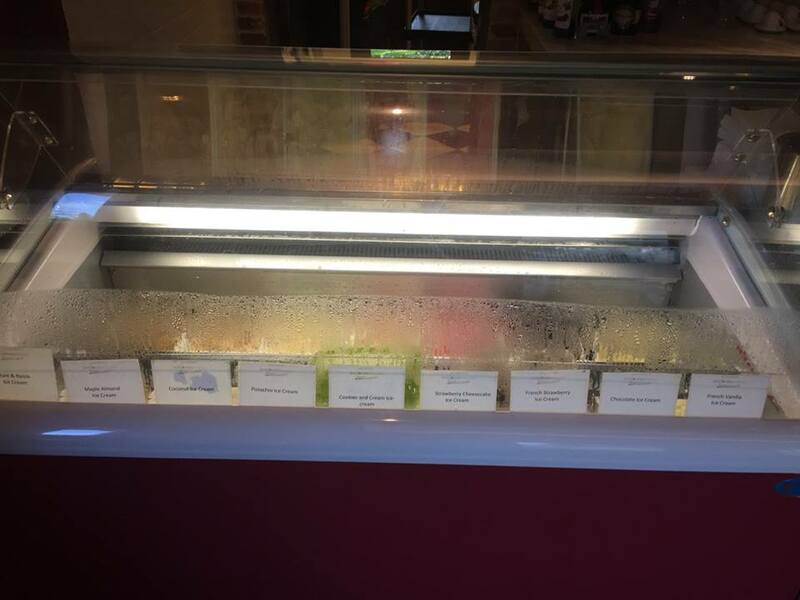 They had plenty of options for everyone. I heard a bunch of people raving about the omelets here. I don't eat them but I've heard that about omelets at other Sandals resort buffets, too. 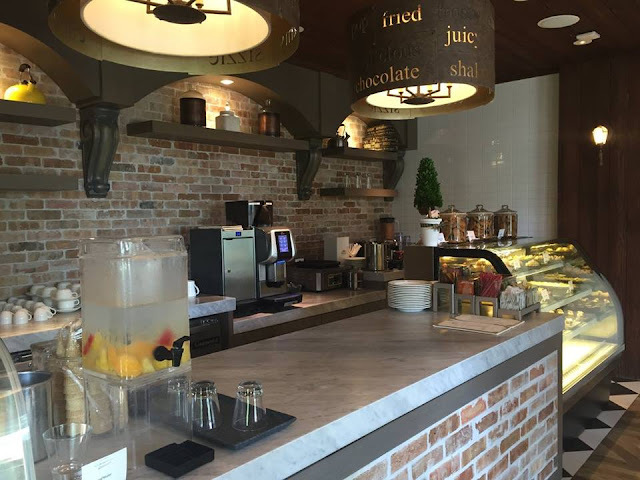 Seems Sandals buffets do omelets really well. Wonder what the secret is. Lunch was similar but with lunch food instead of breakfast food. My husband made a huge salad that looked like a volcano on his plate. I went with a piece of chicken, a tiny bit of potato salad, a scoop macaroni and cheese, and some veggies. The one down side is that their steamed veggies were cooked with butter, so my husband (who can't have butter) wasn't able to eat them. I figured steamed veggies was just that but luckily, I thought to ask someone first and they told me the chef makes them with butter. 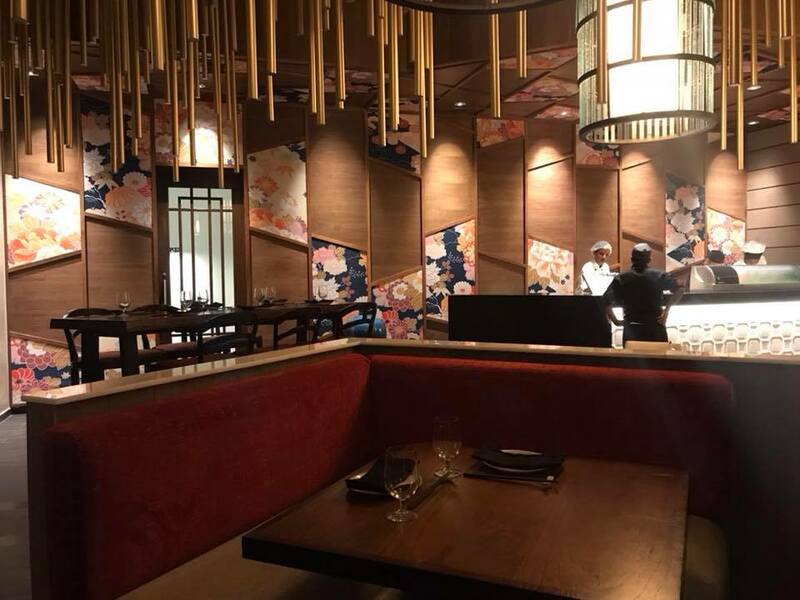 CHI is another new restaurant. 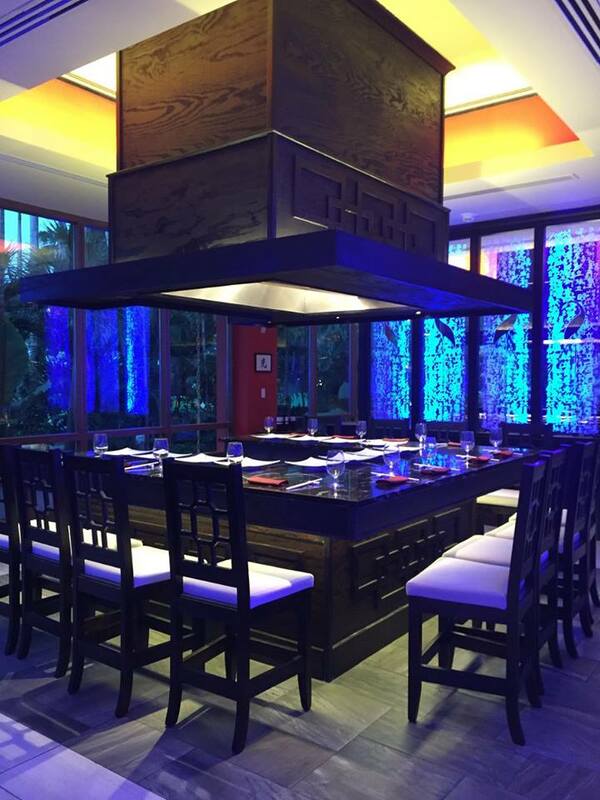 It's Asian fusion style and pretty impressive set up. 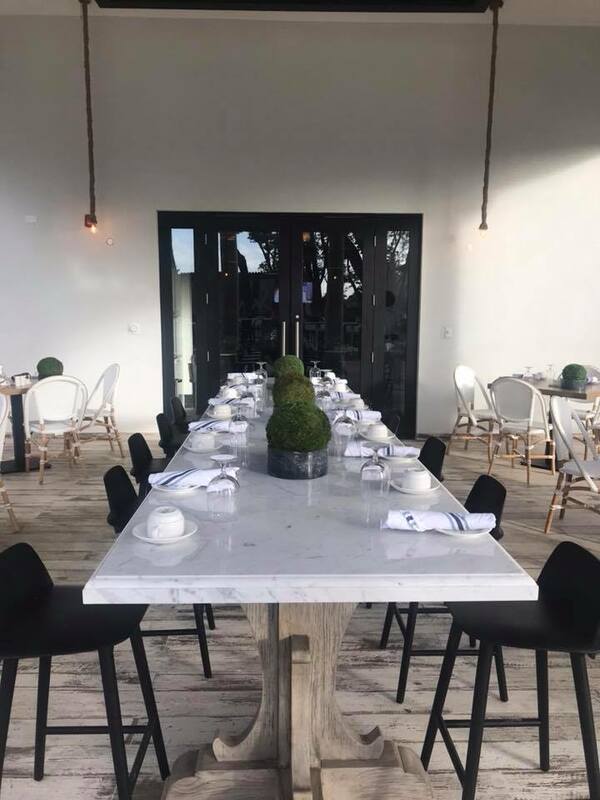 There is a little bit of confusion right now about if this is a restaurant where you will need a reservation ahead of time. 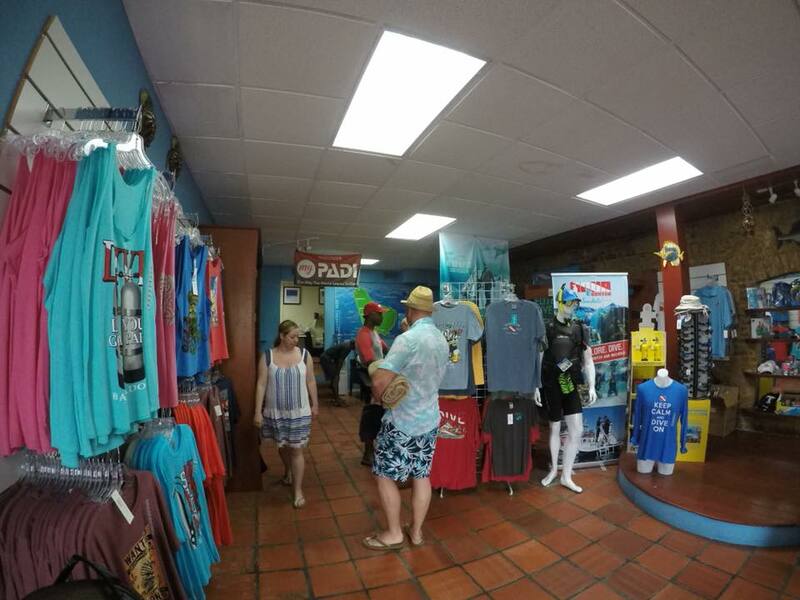 We were told by someone in the sales office that reservations were not needed, but then later were told by Club Sandals that they were in fact needed. So, Club Sandals set up the reservations for us. However, on the Sandals Royal Barbados website it clearly says reservations are not needed. 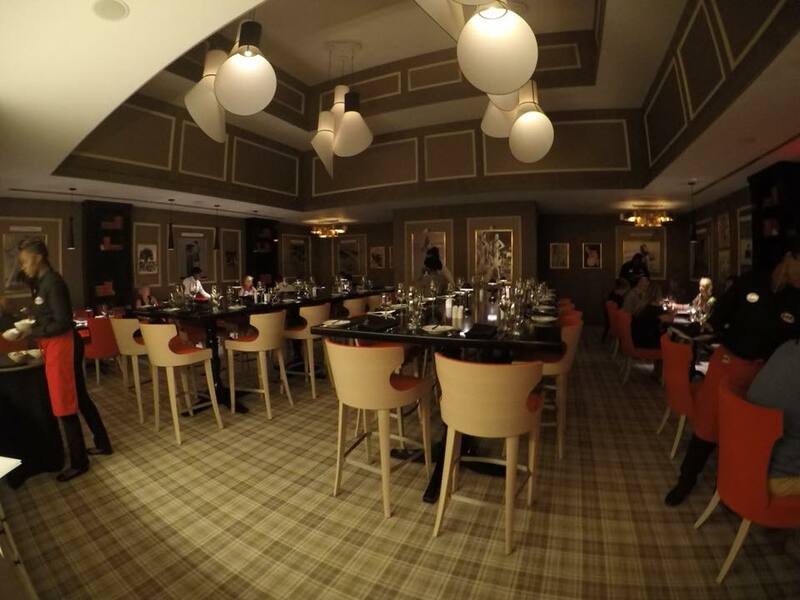 Hopefully that will be sorted out soon, but either way, make sure to contact the Concierge or your Butler to set it up so you don't miss out on dining here. The menu is a nice mix between traditional Chinese, Japanese, Singaporean, Thai food and more. For example, I saw plenty of favorites such as Hibachi Steak, Lo Mein, Pad Thai, Singapore Street Noodles, etc. We ordered the Jasmine Rice, Wonton Soup, Lo Mein and Chicken Fried Rice. 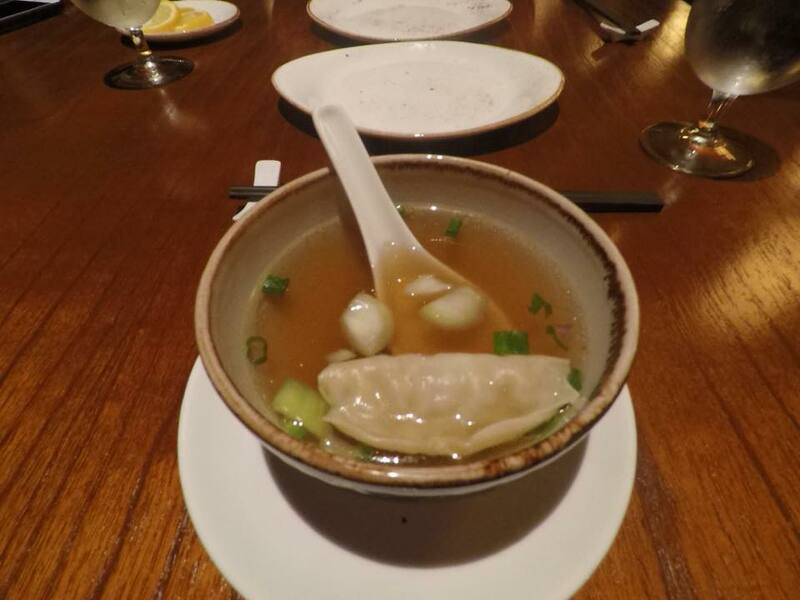 The Wonton Soup was too salty for me. The Lo Mein was very good. 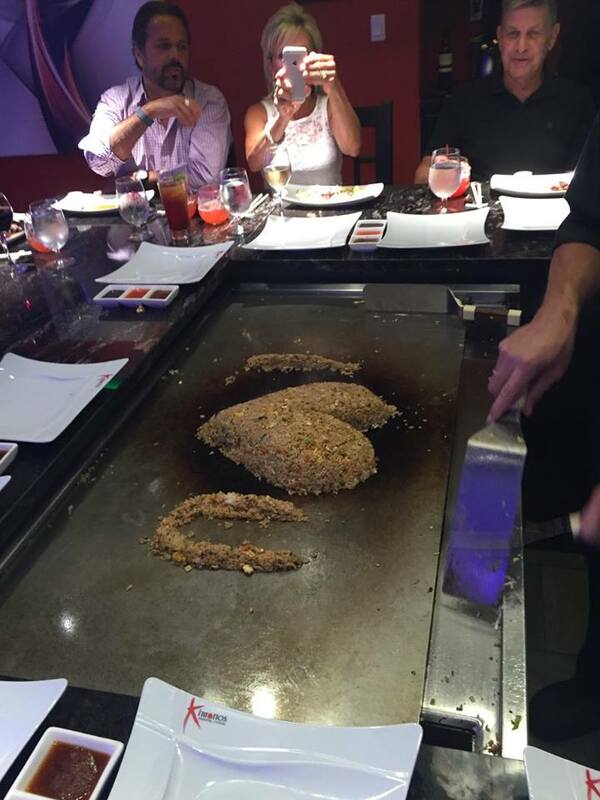 The Chicken Fried Rice was my favorite. I could have eaten three bowls of that alone. But that's the beauty of Sandals. If you don't like what you ordered, try something else, and if you love what you ordered you can order even more of it. 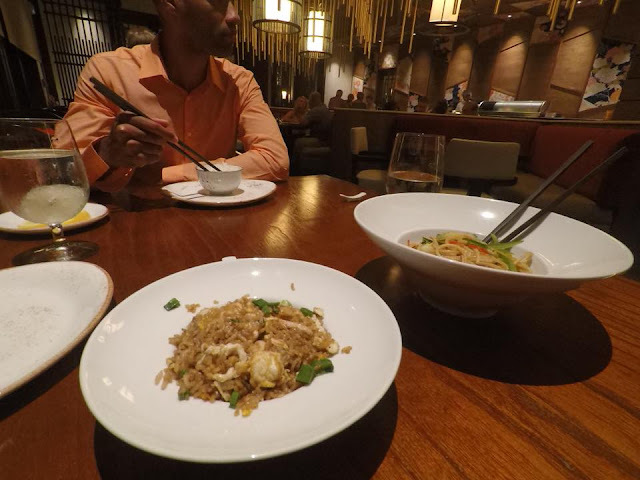 Still thinking about that Chicken Fried Rice. Yum! Nice outdoor seating area which has a view of the main stage, too. 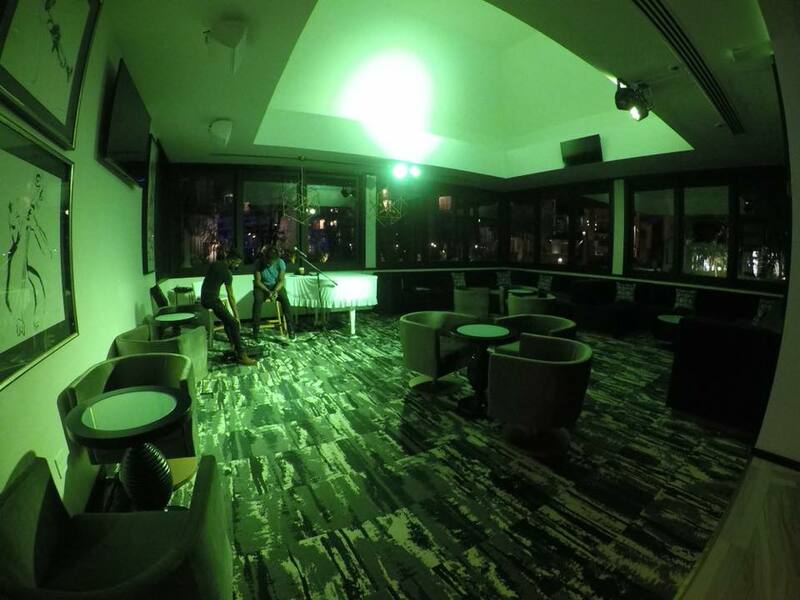 La Parisienne is the new French restaurant which is located up on the 6th floor by the rooftop pool and bar. This restaurant is one that requires dinner reservations and it is very popular. There were zero open reservation spots the entire time we were there, and we were there for a whole week. We kept calling and asking if anything opened and some we spoke to even tried to go and see if anyone didn't show up but were told no unfortunately. 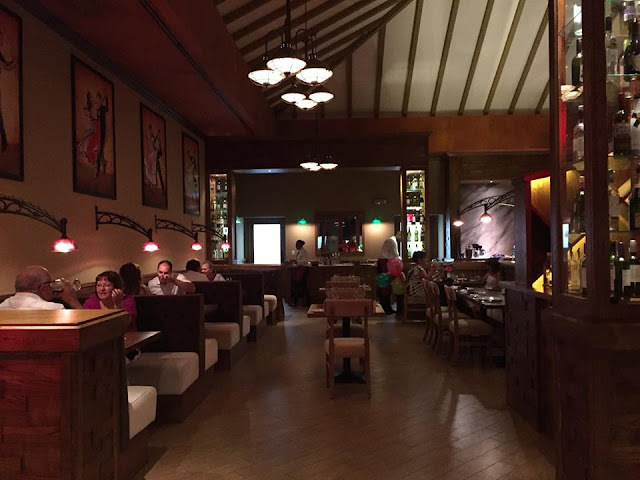 Finally, on the second to last day we spoke to the General Manager who told us they were now opening the French restaurant earlier at 5:30pm so they could accommodate more guests. Unfortunately, due to conflicting dinner reservations already for Chi, we couldn't make it to dinner at La Parisienne, but I was very glad they made that change for others who had been hoping to get seated, too. Wish I could go back and just have appetizers here. Sandals Royal Caribbean does excellent French Onion Soup and I had been craving that all week! I would have loved to see how it compared. We did dine there for breakfast one morning. 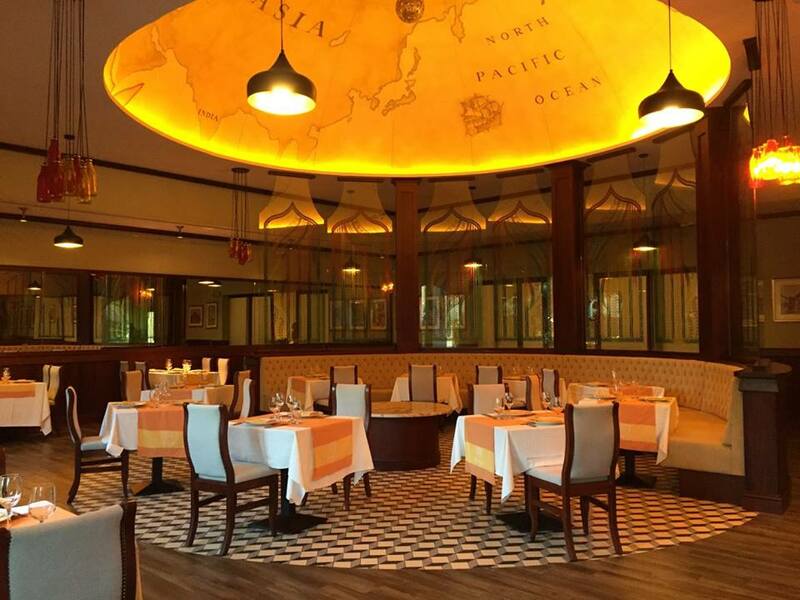 I'll be completely honest, the menu is identical to the Italian restaurant (Portofino's) over on the Sandals Barbados side. 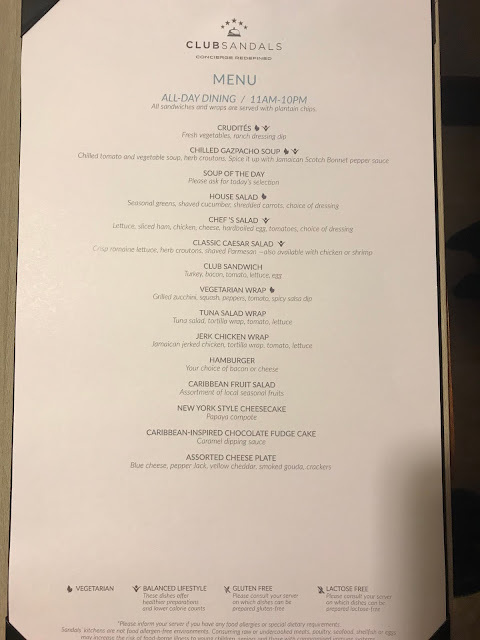 I'm not sure if as time passes if they will change up the menu a little to make it a little more unique, but for now it's their typical a la carte breakfast menu that has items such as Omelets, Pancakes, Eggs Benedict, Steak and Eggs, Corned Beef Hash, etc. Truly, it's identical to Portifino's, and it tastes the same, too, so if you don't want to wait for a table to open at one, you can just go to the other. 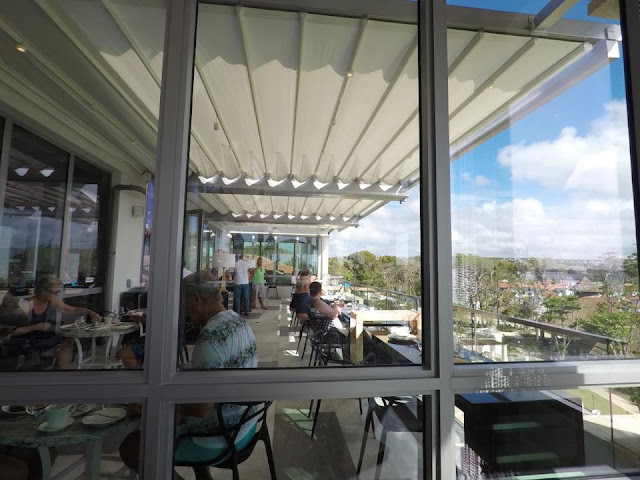 The only difference was that we had a better view at La Parisienne so I would recommend dining there over Portifino's for view alone. Neptunes is the Mediterranean Seafood restaurant that is right by the beach. Again, we didn't dine here for dinner, mainly because we've dined at Neptunes at other Sandals properties before and preferred to try the more unique restaurants instead. But this was our favorite go-to for lunch. Unlike me, my husband is still Vegan and so finding meals for him is always a challenge when we go out. Neptunes had a delicious pasta option cooked to perfection, the Penne Amatriciana, that he was able to oder without the bacon, so we found ourselves back here for lunch several times during our stay. 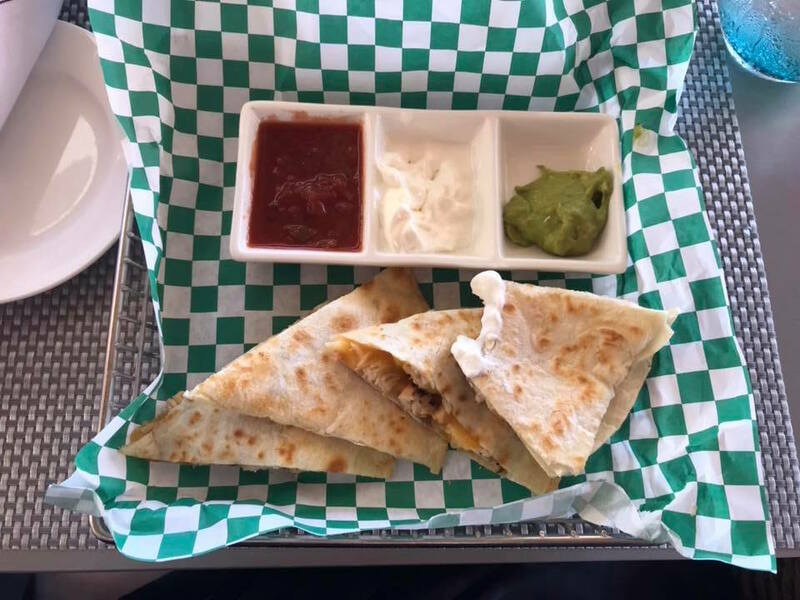 I tried the Island Chicken one afternoon which was good, and the Chicken Quesadilla another afternoon. The food was great and the view from here is incredible. 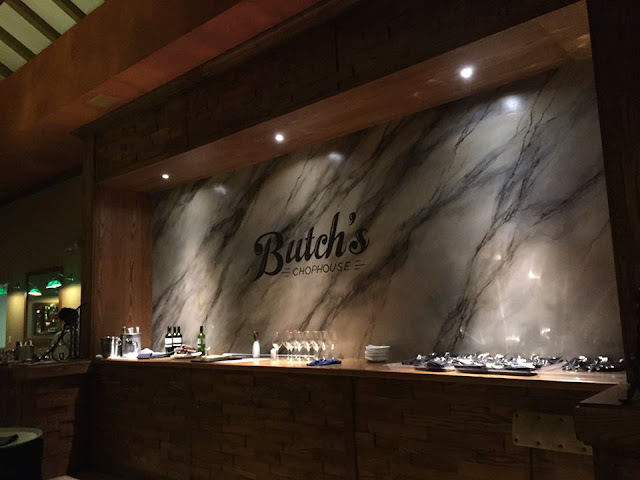 Butches Steak and Seafood was another one we didn't get to dine at. We had a reservation for the last evening we were there, but they could only get us in at 9pm and we had a 4am check out the following morning, so we knew it wouldn't be a good idea. 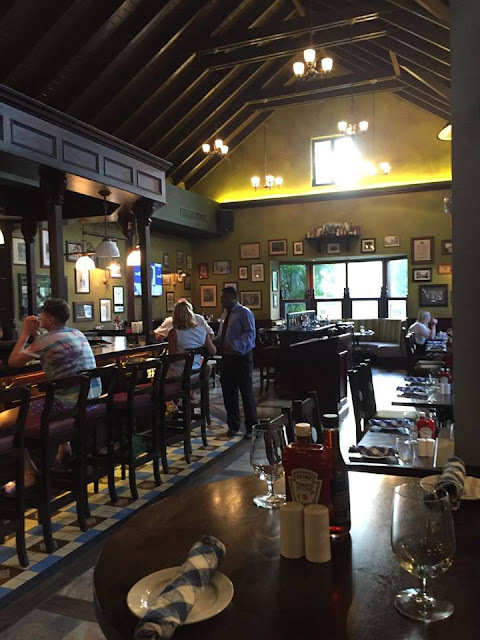 Plus, we'd already eaten two nights prior at Butch's Chophouse on the Sandals Barbados side, which has a very similar menu and I liked their menu better. So we were okay with skipping out on it this time. But I did peek in and take some photos. So for those who may not already know, Sandals Barbados is the "older" resort (by three year). 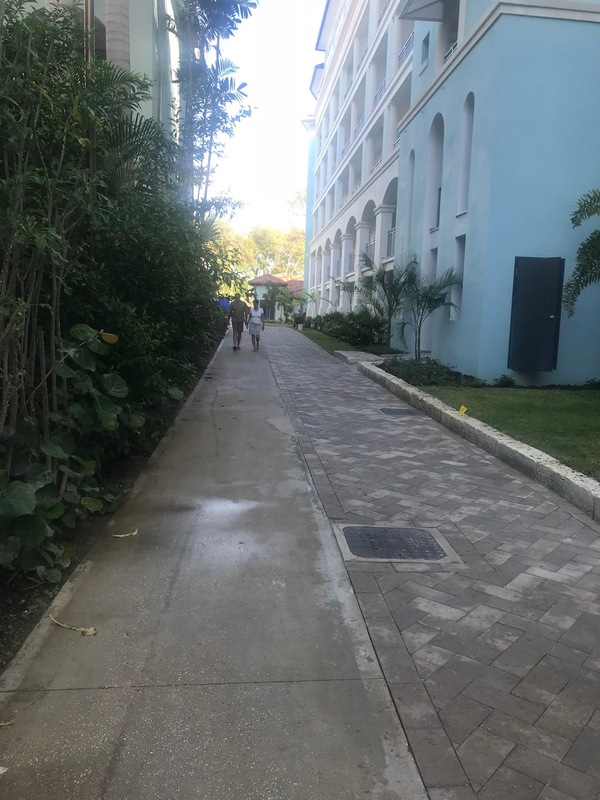 But Sandals Royal Barbados was built right next door and you can easily walk between the two. Anyone staying at either property can go to the other one to dine, drink, swim, enjoy entertainment, etc. 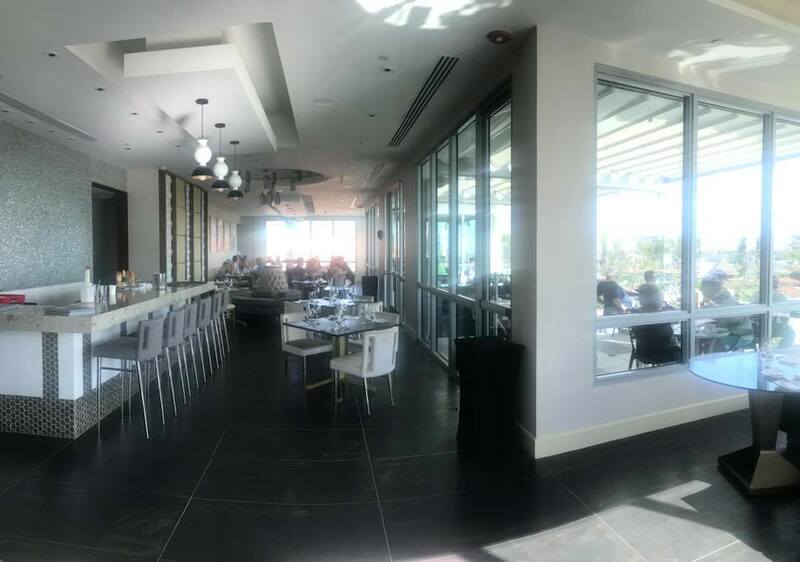 Even though you're paying to stay at one resort, you're getting the inclusions of both, which is a great perk, especially when it comes to dining. 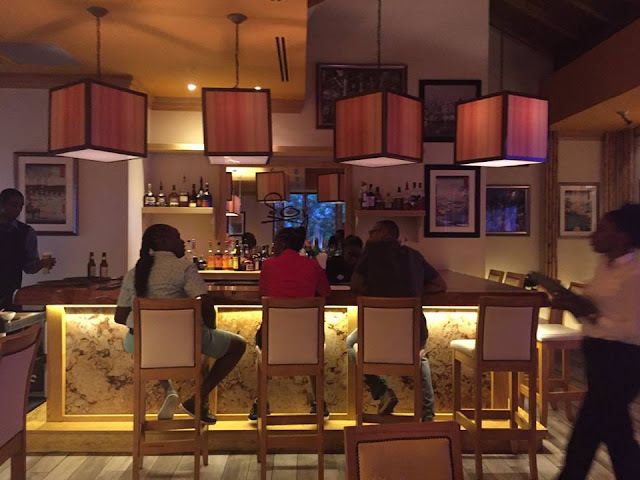 In my honest opinion, I feel that Sandals Barbados has the better dinner options and Sandals Royal Barbados has the better lunch options. 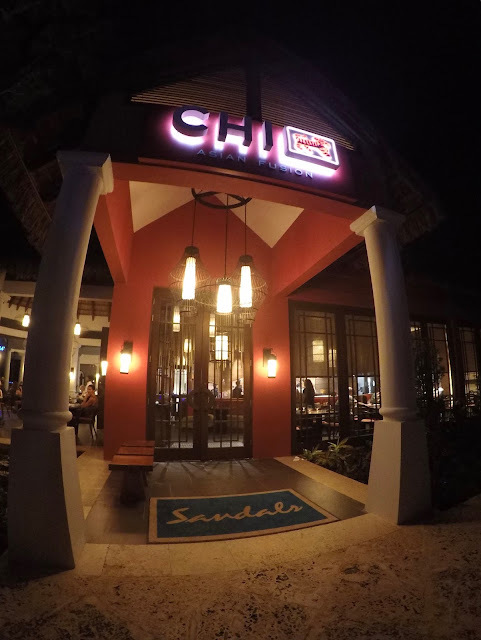 Soy was the first place we dined at on night two, and we always love Soy at all the other Sandals Resorts and Beaches Resorts so we try not to skip it when we're at a property that has one. Soy at Sandals Barbados is one of the best ones, probably second to Beaches Negril which has a fantastic Soy. 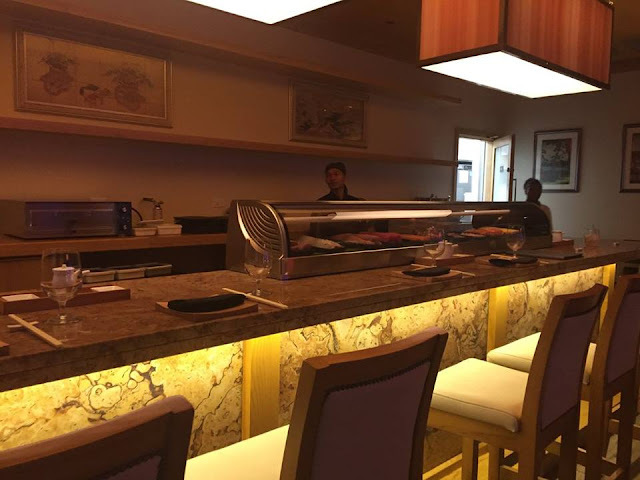 Kimonos is the Japanese Hibachi restaurant in the same building as Soy. We didn't dine there this time because we dined there last time we were at Sandals Barbados. 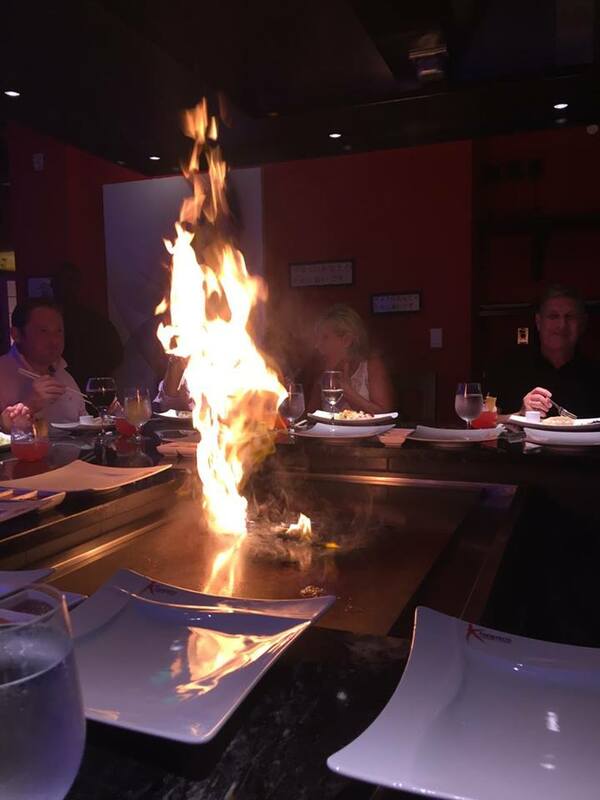 It's a fun experience to watch them cook the food in front of you, and the food was great, but on this trip we just weren't up for it all. But I do highly recommend it to others who haven't been. This Kimonos is one of the best, second again probably to the one at Beaches Negril which has been the best Kimonos we've eaten at so far. Here are some photos from our last stay, just for reference. 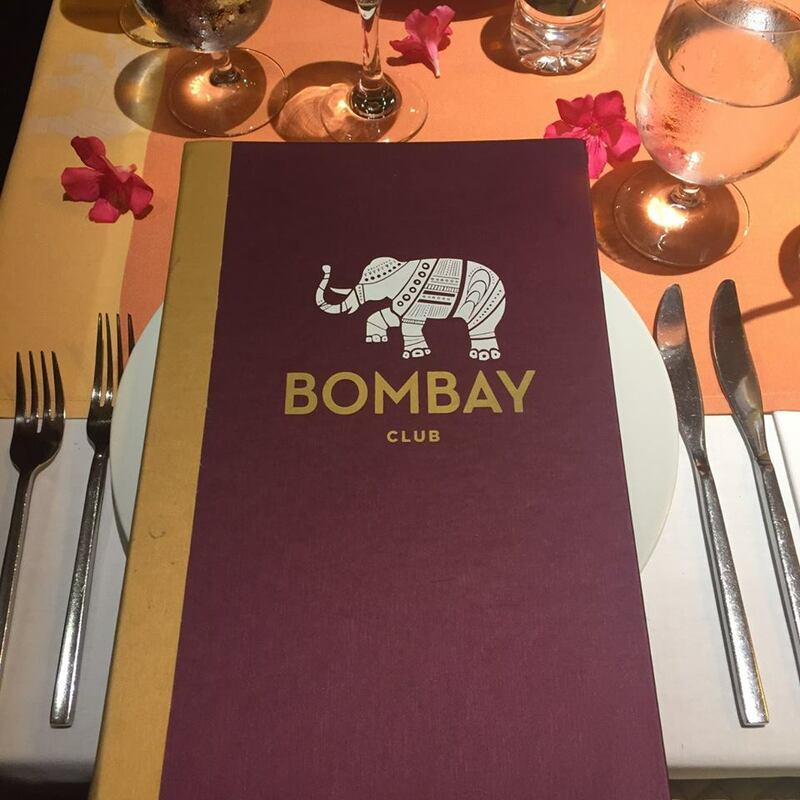 Bombay Club was probably the best of all of them when it came to my husband being a Vegan. Most of the waitstaff kept confusing Vegan with Vegetarian and so he'd have to explain "no eggs or dairy like milk or cheese either". But at Bombay our waitstaff was on top of it. 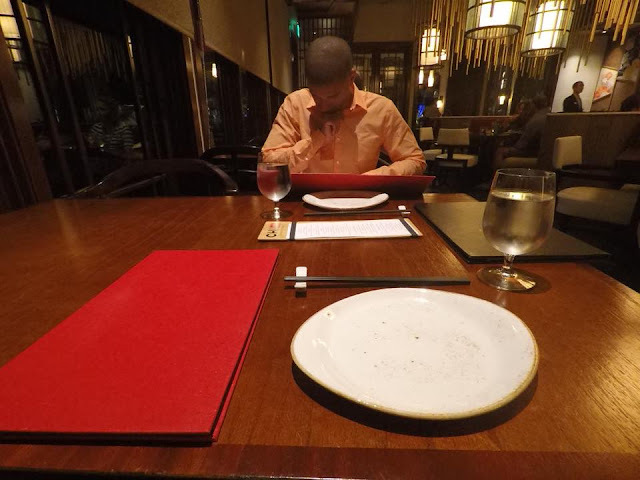 He asked about ordering something that looked Vegan-friendly on the menu but the waitress (I wish I had written down her name) told him immediately "that is made with eggs and milk, you should order this instead". We were very impressed. He made sure to tell the restaurant manager on our way out, so she got the praise she deserved. 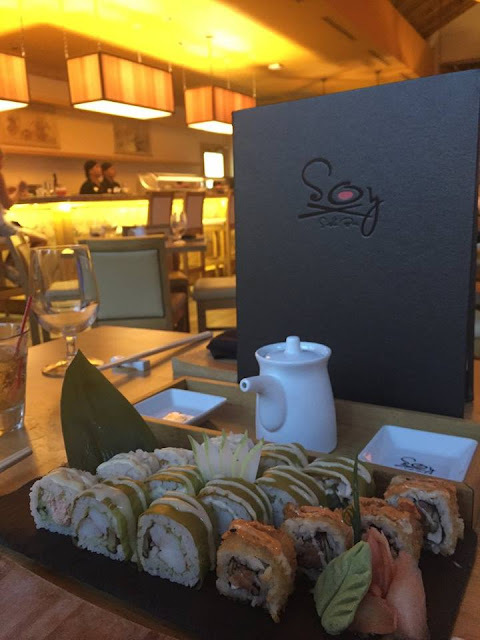 The food here was great too. I had the Tomato Soup for the appetizer and the Chicken Tikka with Plain Basmati Rice and Naan for dinner. It was all so delicious! Last time I had the Butter Chicken and that was very good, too. My husband ordered Kashmiri Puo Rice, Tandoori Roti, and Dal Basanti. He loved it. Butch's Chophouse is a culinary experience in and of itself. It requires reservations, so don't sit on it. Make sure to make them as soon as you've checked in so you don't miss out. I'm not going to lie, this restaurant is the reason I broke my Vegan diet a month before traveling to Sandals Royal Barbados. 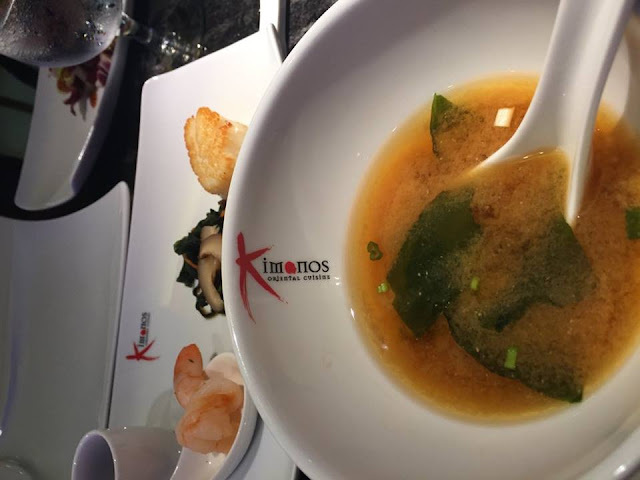 I knew I would break it while traveling here just because the food at this restaurant is that good, and I didn't want to be sick the whole week because my body wasn't accustomed to eating that food anymore. 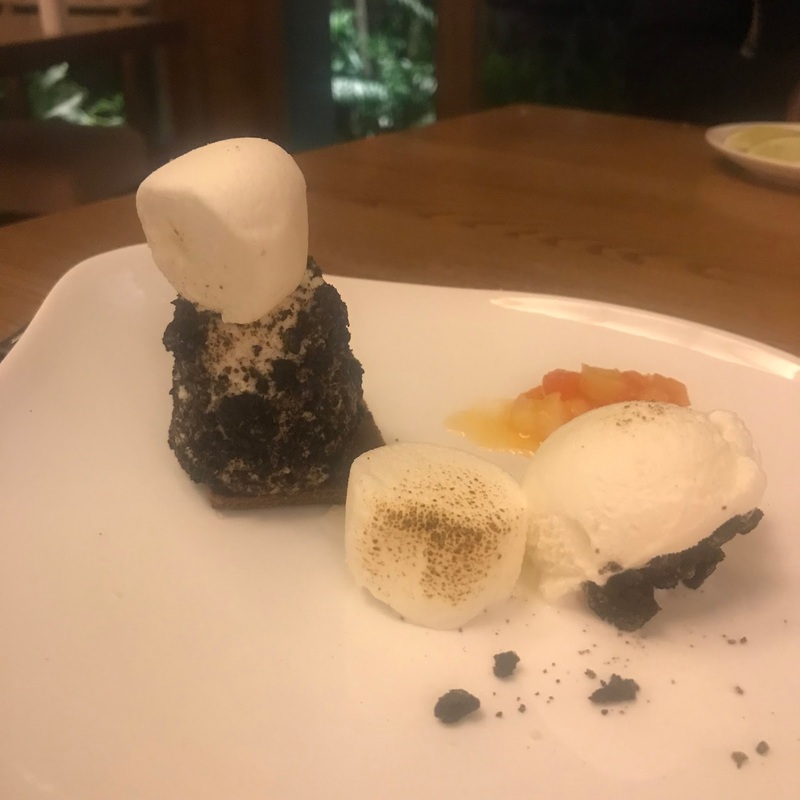 I like the menu here better than over at Butch's Steak and Seafood, especially because of the Oreo Cheesecake with Fire Roasted Marshmallows. My mouth is watering just thinking about it again. The filet minion was cooked to perfection both times I ate there. 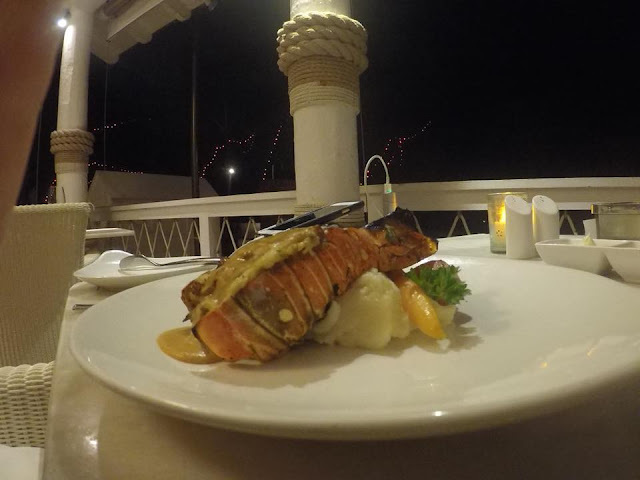 Also, the lobster tail was perfect last time I ate there. And the lobster mac and cheese that I tried this time was so good. No photo I could ever take would do it justice. 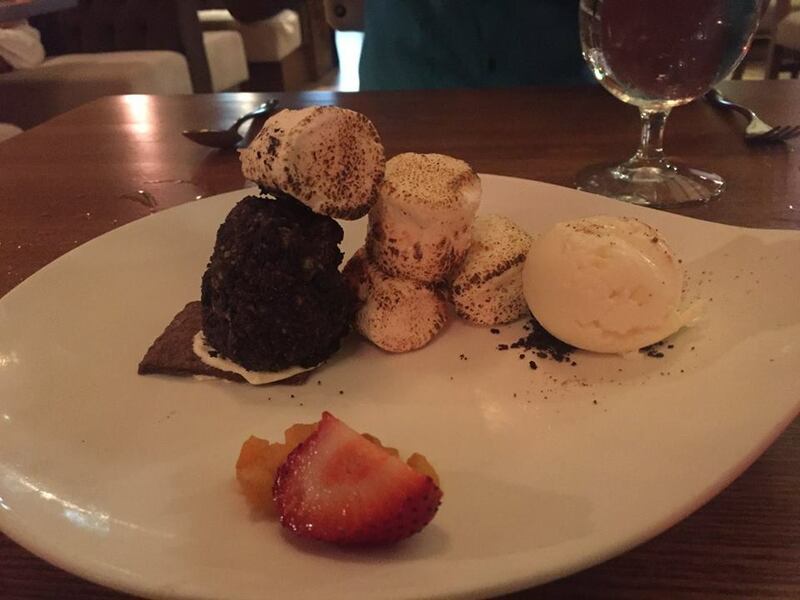 Oreo Cheesecake with Fire Roasted Marshmallows. Mariners is located right by the beach and the main pool at Sandals Barbados. We dined here for lunch twice. The food was pretty good but nothing spectacular that I felt I had to rush back to eat again. The first day I had the Chicken Panini and that was okay. The next time I ordered the Chicken Quesadilla and it tasted exactly the same as Neptunes which is just a minute stroll down over to the other side of the beach. Only difference was the fries at Neptunes were like McDonald's fries and the ones at Mariners were curly fries. 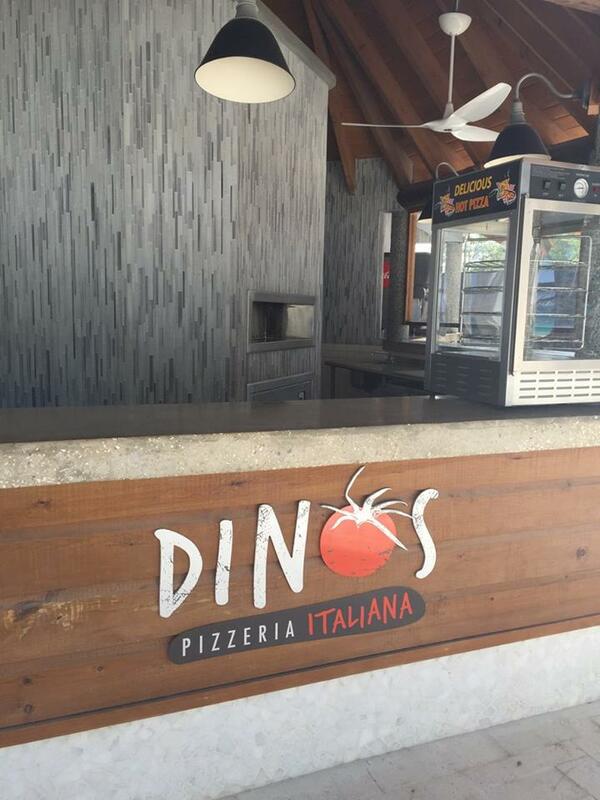 Dino's Pizzeria is right next to Mariners and you can sit at either spot and order off of both menus. I ordered a Margarita (normal cheese) pizza and that was great, as always. My husband tried a Veggie Pizza (they let him custom make it without cheese) and he said it was okay, but he wouldn't order it again. He also had a Veggie Wrap which he didn't like because he said it was full of oil (or possibly butter, which he can't eat). There is also a self serve soft ice cream machine and a popcorn machine at the Dino's area, too. Anyone walking by can help themselves to some. Area to sit on the beach while dining. 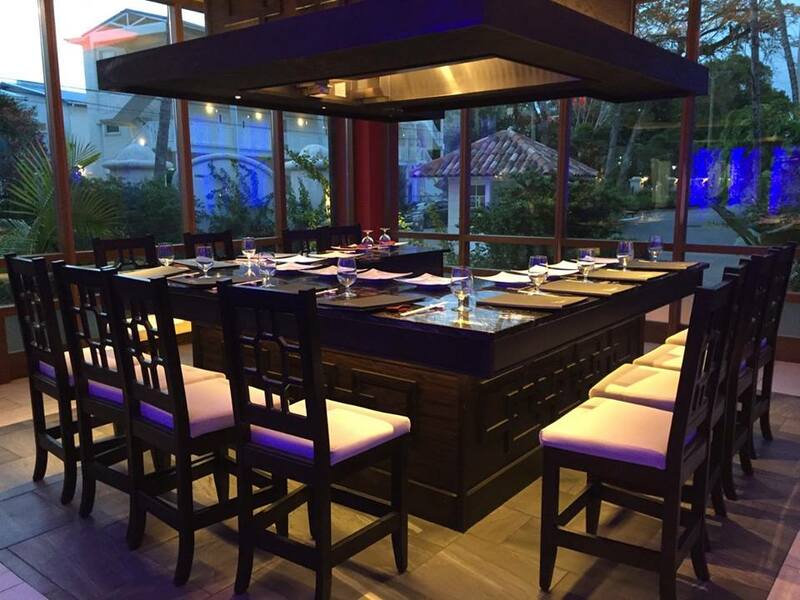 Spices is the buffet option over at Sandals Barbados that's in the building by the main pool. 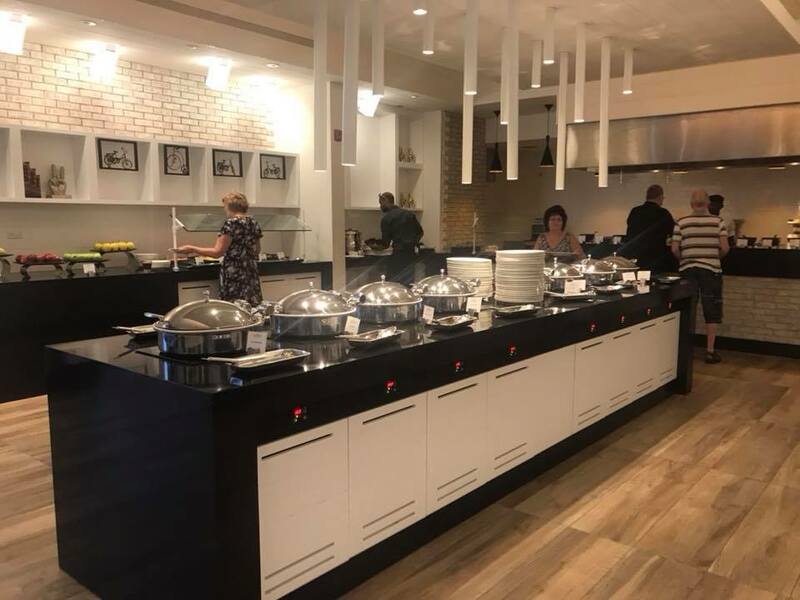 With so many delicious a la carte options at both Sandals properties, we tried to stay away from the buffets when we could. But we did pop in here at one point to grab a banana and croissant for the road when we went to do the snorkeling trip that left at 8:30am. It's a nice set up, clean, and the same food selection as the American Tavern for breakfast. For lunch, I'm not entirely sure but I expect it's a similar menu then, too. 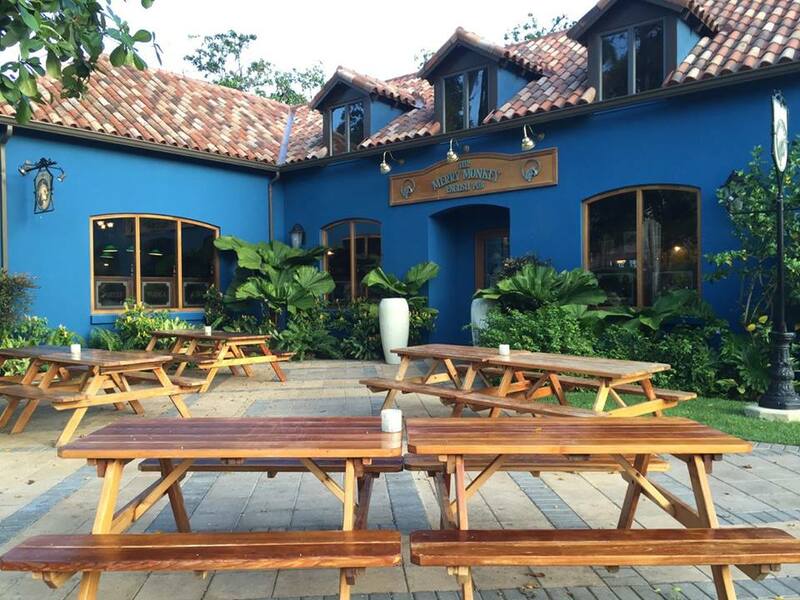 Schooner's is the Seafood Grill right by the beach. Beautiful place to sit and eat at sunset as the sky changes colors and the water turns the same pastel shades of blue and purple and pink to match the sky. We hadn't dined here last time and felt we needed to try and it and I'm glad we did. I probably wouldn't bother going back next time. My husband had a salad which he said was great (the best salad he had so far) but then his special order pasta came out and he was pretty sure they put butter in it, which he told them he couldn't have. My lobster was overcooked, which shocked me because it's a Seafood grill and I figured they of all places would cook the lobster perfectly. It was far too chewy and had no taste. The green sauce was so bland I wasn't sure if it was actual sauce or the "tomalley" (aka nice word for that green "poo" inside the lobster). 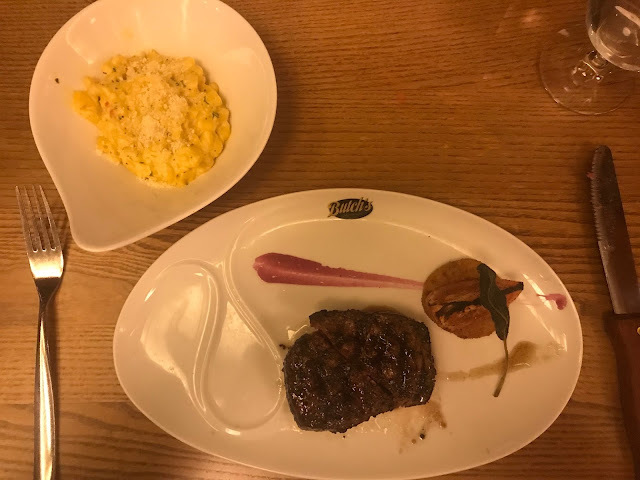 I realized it was their actual sauce when I noticed a small bit of it on the plate next to the mashed potatoes to be used as a dipping sauce. I was pretty disappointed with that. 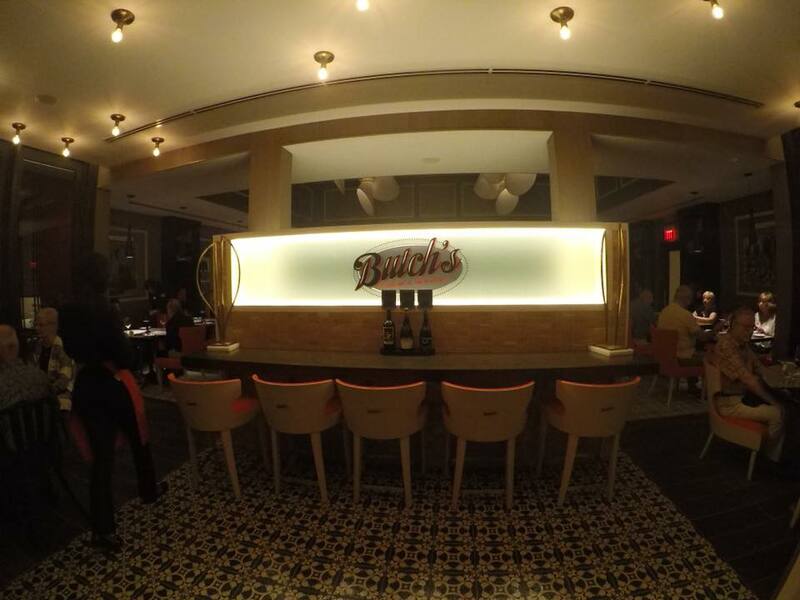 Next time, I'll skip Schooner's and head over to Butch's for lobster. View from our table as the sun was setting. Portifino's is the Italian restaurant that we ate at for breakfast the first morning, and then again for dinner the third night. 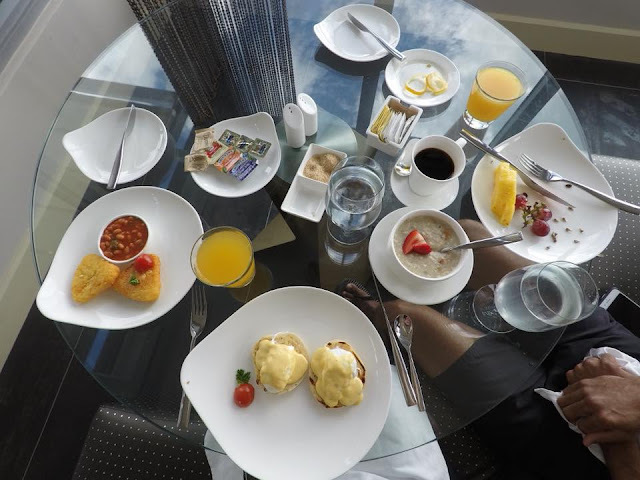 For breakfast, it was the same menu as you'll see at most restaurants for breakfast at Sandals. Like I mentioned above with La Parisienne on the Royal side. For dinner they did have delicious pasta and it was good enough that I couldn't quite tell if it was homemade pasta or not. 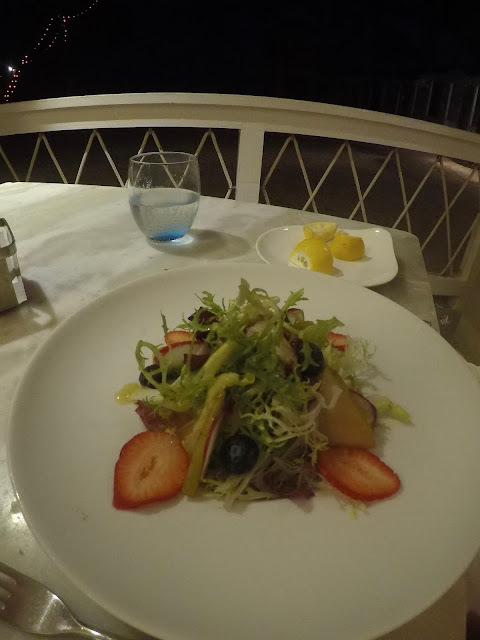 At Sandals Negril we ate at Cucina Romana and we could both tell that pasta was handmade fresh. 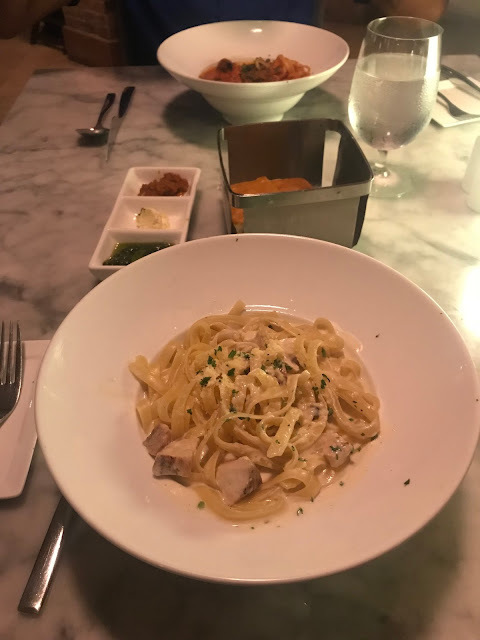 My husband ordered pasta that he enjoyed, but had a hard time finishing. 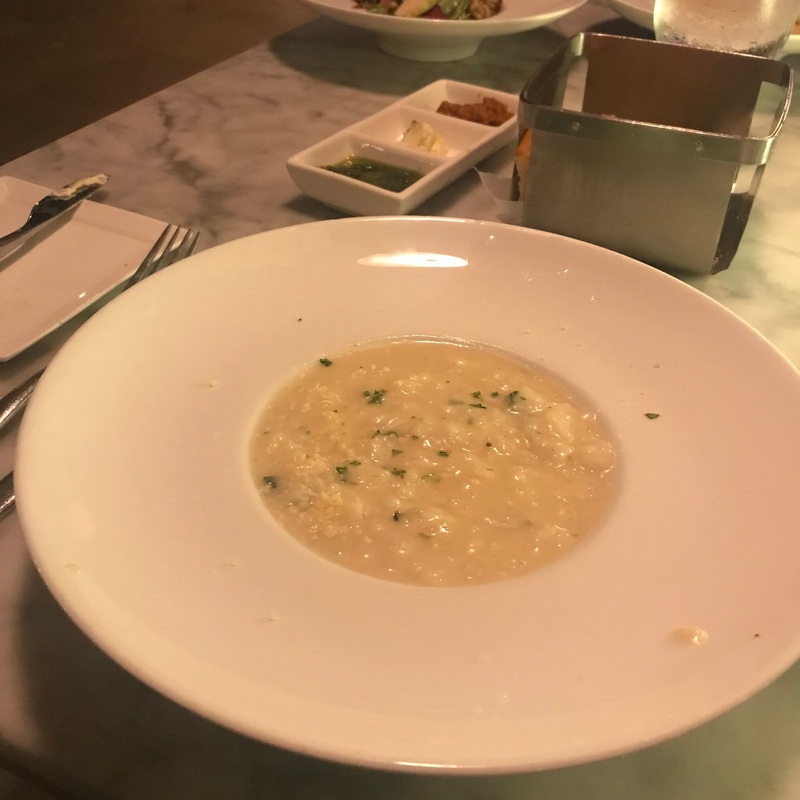 I ordered a risotto appetizer that was more like rice soup than risotto. But it was still very good flavor. Then I had Chicken Fettuccine in a cream sauce (I asked for it instead of the seafood version of it so this was a special order). It was very good, but again, too much food and we couldn't finish it. I wasn't expecting the portions to be so generous. I felt bad walking away from the food. Wished I could have brought it back to the room and eaten it later when I was hungry again! The Merry Monkey Pub is one of my favorite spots on property. This is a great place to hang out in the evenings, have a drink, watch a game, or just play a round or two of billiards/pool. 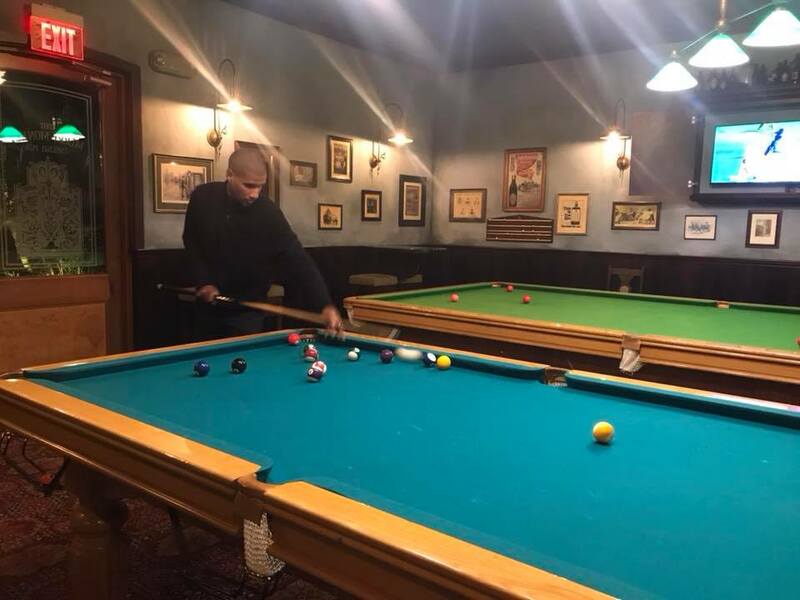 In the evening my husband and I like to play pool while we wait for our dinner reservations. 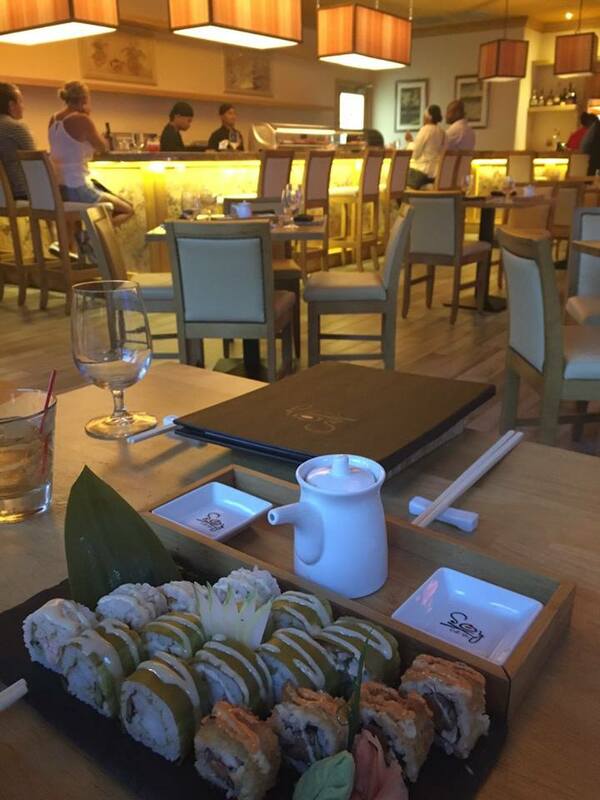 Sometimes we'll even order an appetizer there while we wait. This time around I ordered the Cream of Asparagus Soup this time and it was very good. Originally my husband ordered the Curried Vegetable Pie, even after telling them he was Vegan. 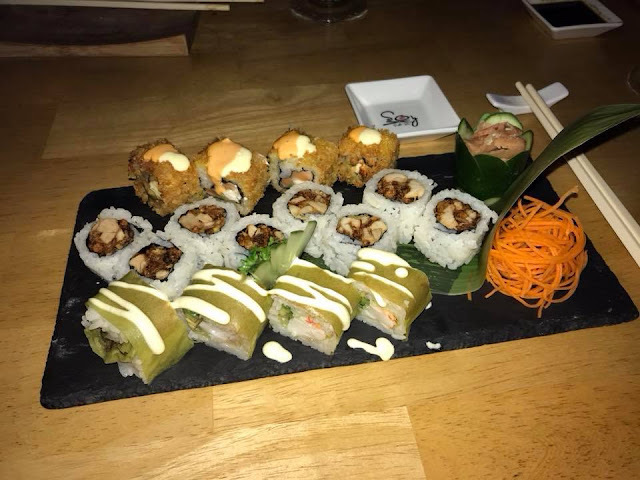 They made it, brought it out to him and before he could take a bite they took it away realizing they'd made a mistake and it wasn't Vegan. Instead they brought him out a special order of Basmati Rice and steamed vegetables. Cafe de Paris is the last restaurant on the list and I saved the best for last. 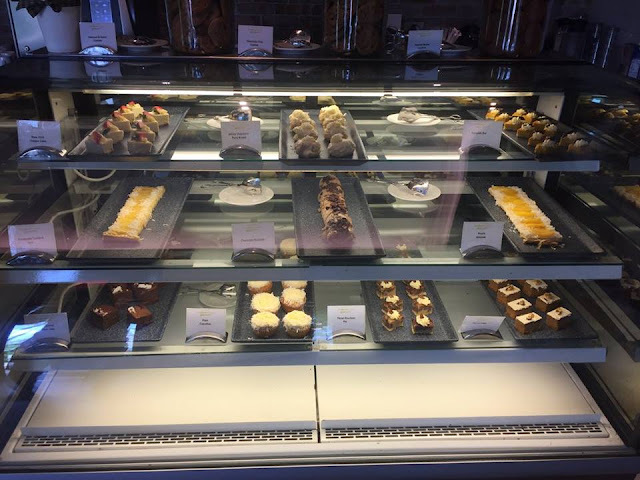 :) This is the place you want to go to if you have a sweet tooth. 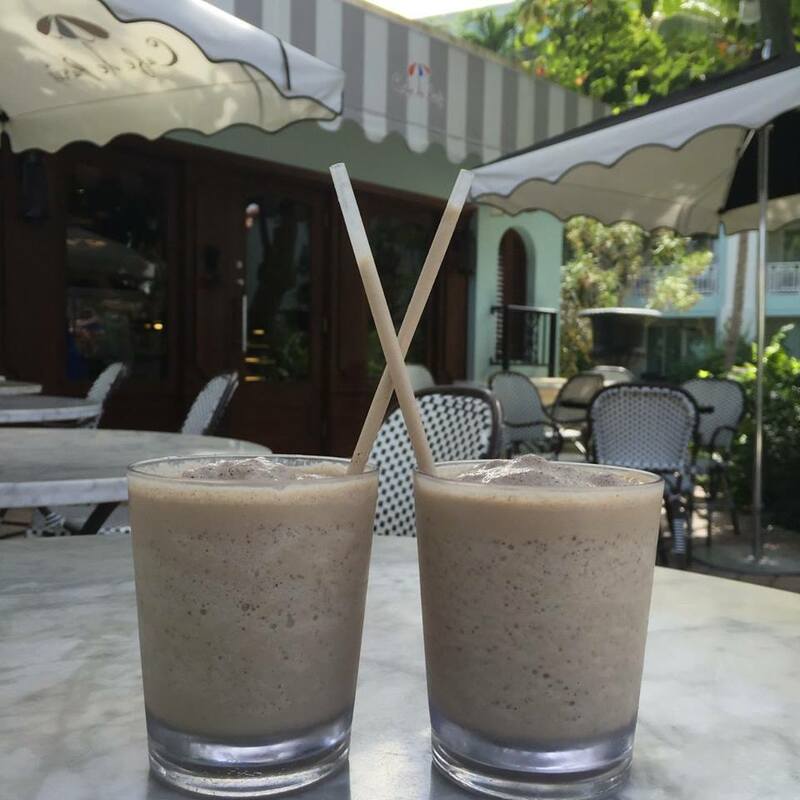 Do yourself a favor and pop in here at least once and order yourself a Cookie Crumble (even if it's without the Bailey's). It's SOOO good. Late night ice cream craving? This is the go-to place. Also, make sure to stop by the Sandals Barbados lobby and pick up the oatmeal raisin cookies across from the front desk. Also, there is a Hot Dog Cart which isn't officially labeled as a restaurant but it is available to guests. 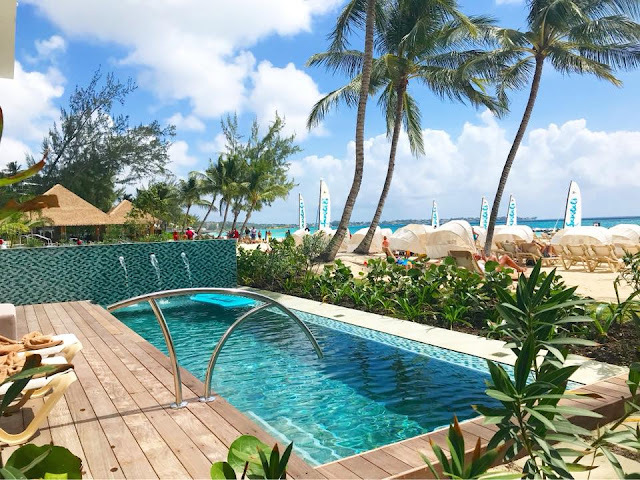 You can find it by the main pool at Sandals Barbados near Spices and Scooner's. You definitely don't want to miss it if you like hot dogs. I saw a lot of people grabbing one and then heading to the lounge area by Spices to watch a football game one afternoon. I try very hard not to be a complainer, but I do have to discuss this briefly. I was a bit disappointed in my experience making reservations through Club Sandals. 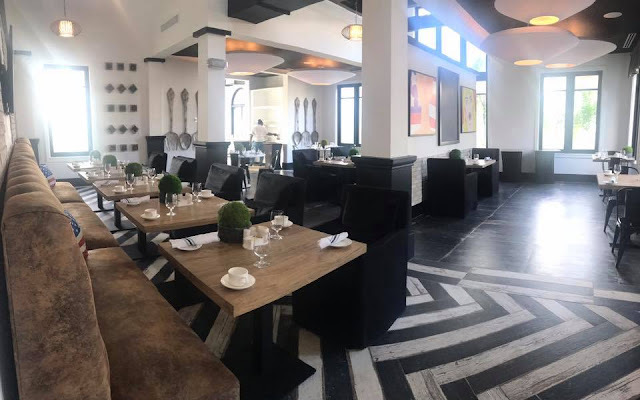 After the General Manager told us that the French restaurant was now opened at 5:30pm and more seats may be available, I called down Club Sandals and spoke to Shannon. She confirmed that they had a 5:30pm open for that evening so I asked to take it. But she told me because we already had a reservation at Chi and we couldn't make a reservation for two restaurants in one evening. 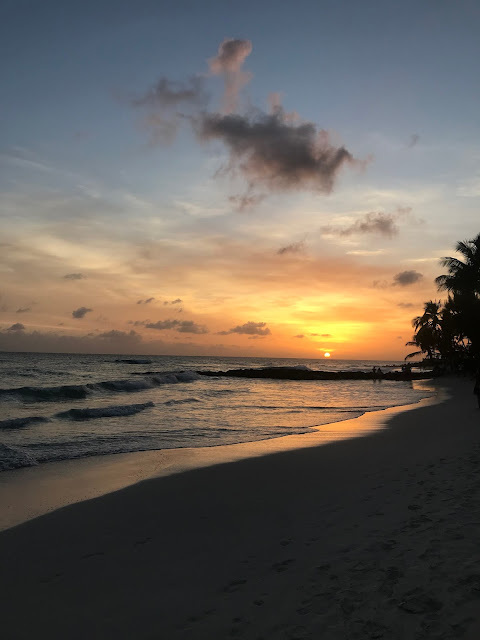 I'm a frequent Sandals guest and my husband and I sometimes stay for only a few nights and cram several nights of dining into that short stay so we can try all the restaurants. Never had we ever been told we couldn't make reservations for two restaurants in one night. In fact, I explained to Shannon that I already had two reservations for that night- one at Chi for 7:30pm and one for Butch's Steak and Seafood at 9pm. She told me "that shouldn't be" and I told her I had a reminder card for each from Club Sandals confirming that date and times. They had slipped them under our door the day before. She told me either way, I couldn't make another reservation, so we had to give up the French restaurant for Chi, since we only had one night left. At first I told her we could take the reservation at the French restaurant for 5:30pm and then I would just take the card saying we had a 7:30pm Chi reservation to Chi after so they'd seat us, too (considering I still wasn't even convinced that Chi actually needed reservations). But she told me I wasn't allowed to and that she'd have to come upstairs and take away our cards saying we had a 7:30pm Chi reservation and a 9pm Butch's reservation. I couldn't help it but I laughed, said no, and hung up. Never had I had issues like that making reservations and when I sell Sandals to my clients, one of the selling features is that you can dine at any restaurant as much as you want. This was a huge disappointment and I still am a bit confused about what actually happened and why. 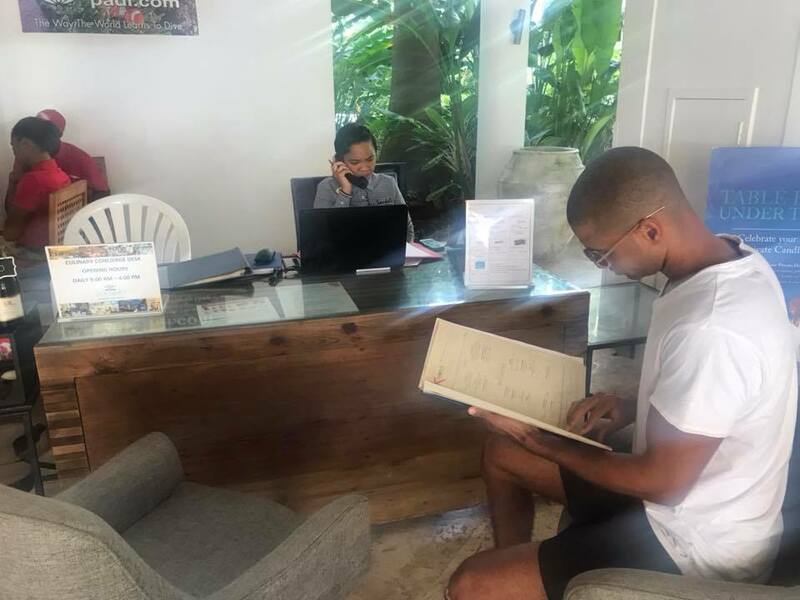 A few hours later after heading to the beach to relax, we returned to the room and a card had been slipped under our door while we were gone saying a reservation had been made for us at La Parisienne for 5:30pm. It was 5:45pm when we found it. I panicked thinking they must have cancelled our Chi reservation, too. Needless to say, we missed eating at the French restaurant but showed up at 7:30pm to Chi anyway and of course they sat us without a problem. The place was half empty. The whole ordeal was for nothing. I'm hoping they get this straightened out soon so it doesn't cause other people similar headaches, too. I know I've mentioned a few times how my husband is traveling to Sandals for the first time as a Vegan. Long story short, some health issues forced him to go Vegan and I went Vegan with him by default (it's hard to cook meat when he can't stand the house smelling like it and it's expensive to buy two different types of milk, cheese and butter). So we went Vegan in July 2017. Then right before Christmas, I broke my Vegan diet but he didn't. This was the first time we'd be traveling to Sandals with any dietary issues. Sandals has told us for years that they'll take care of anyone with dietary restrictions and I've sent clients with dietary issues and they've raved about how well Sandals took care of them, so I wasn't overly concerned. The first thing my husband did was sit down with the Culinary Desk which is located at Sandals Barbados near Spices (by the Watersports desk). My assumption was that anyone working the Culinary Desk would automatically understand the basic food allergies, aversions, diets, restrictions, etc. However when my husband said he was Vegan I could tell they knew what he was saying but didn't quite understand it. Me expectation was that we would sit down with a culinary expert (like a chef) and they would come up with a menu for him that my husband could bring to the restaurants and the waitstaff and chefs would know exactly what needed to be cooked for him so that there was no confusion. That was how it was always explained to me when I asked Sandals how dietary issues were handled on property. Sadly, that was not the case here. 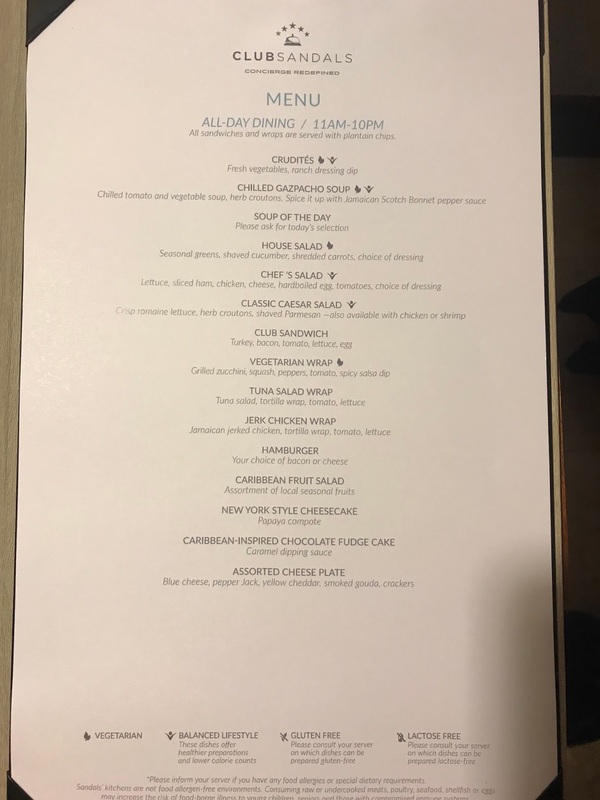 The woman working the Culinary Desk advised my husband to look at the menus (which they provide copies of at the desk) and from the menus, see what items he could customize to order. So for example, if there is a Pear and Arugula Salad with Goat Cheese, he'd have to make sure he conveyed to the wait staff that he needed it without Goat Cheese. Very much like when dining out at home. It was a pretty underwhelming experience. 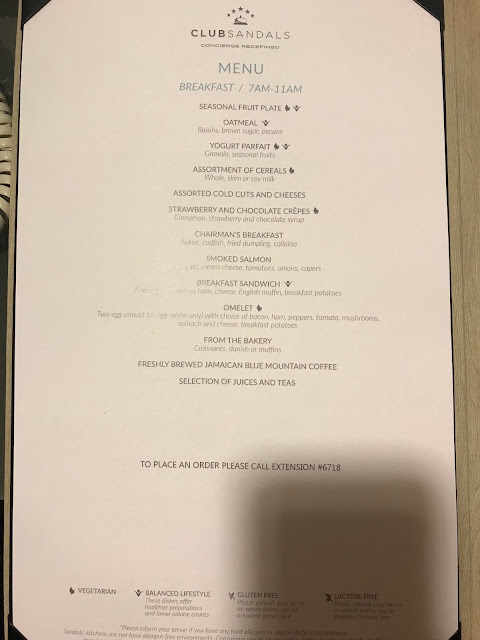 I expected it to be like with some other resorts where you're given a card that alerts the staff to your dietary restrictions, or it shows up as an alert on your reservation when you arrive at the restaurant and they put in your room number, and they'd just know so there was no confusion. They'd know only to cook food off of an approved menu based on your dietary needs. But in this case, every place we dined at we had to verbally tell everyone that he was Vegan, several times, and then most cases than not he'd have to also explain what Vegan meant, to be 100% sure they understood. Many of the waitstaff seemed to confuse it with Vegetarian. I am certain at least once or twice he had food with butter in it, which caused him a lot of discomfort during the trip. This was the one thing we had the most trouble with. It was a little disappointing that it was such an issue on this trip. I had no idea how difficult it was to travel with someone with dietary restrictions and this trip was a huge eye opener for me. 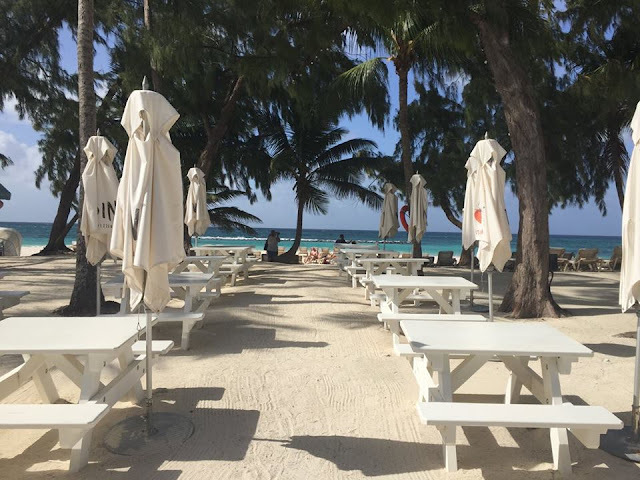 Some of the Sandals and Beaches Resorts get it so right, and others fall a little short. I think it depends on how educated the staff are when it comes to these things and I truly thing it's just part of the "growing pains" of this being a new resort with a lot more new staff on both sides. All in all he told me he gave them a B+ for Vegan options, but I would have loved to see them take a little more care in understanding what the different food issues were. Luckily he doesn't have any serious allergies so getting a little butter in his food won't kill him, but it will make him feel miserable for a day or two, and it could be avoided if they had a better system and were more aware of the issue. My recommendation would be, if you have any food allergies or dietary restrictions, pay close attention and make sure you're taking control of the situation. Ask what each item is cooked with to make sure even the bread isn't baked with ingredients you can't have. Someone may need to be told a few times, or if they don't seem to be understanding, ask for the restaurant manager or even the head chef instead. Especially if you have severe or life threatening food allergies and are concerned about miscommunication or issues like cross contamination. 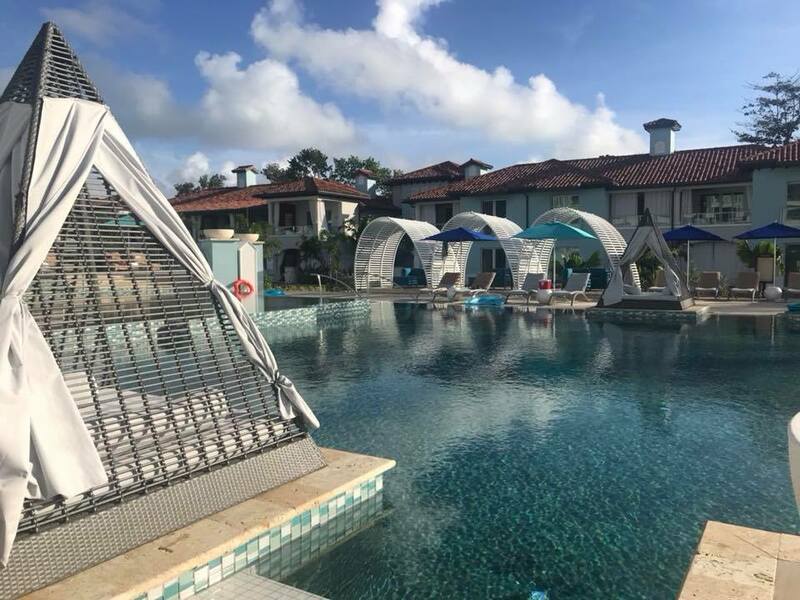 Also, note that on the Sandals website it states "Please note that there is a 1-month notice required prior to arrival for any special preparations or special products not carried on the resort, including kosher meals." So make sure to keep that in mind as well if you are Kosher or you need things special ordered for your dietary restrictions. One of my favorite parts of the new Sandals Royal Barbados is Lover's Lane, the bowling alley. 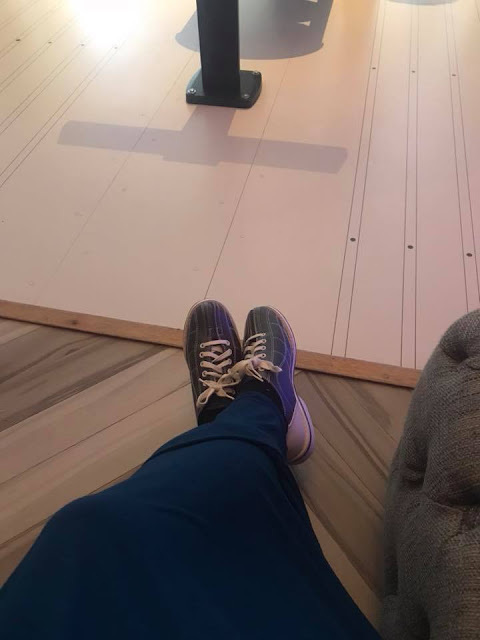 I don't bowl much at home, but we go from time to time if a work event is being hosting at one. It was a lot of fun to be able to just walk in there and bowl. 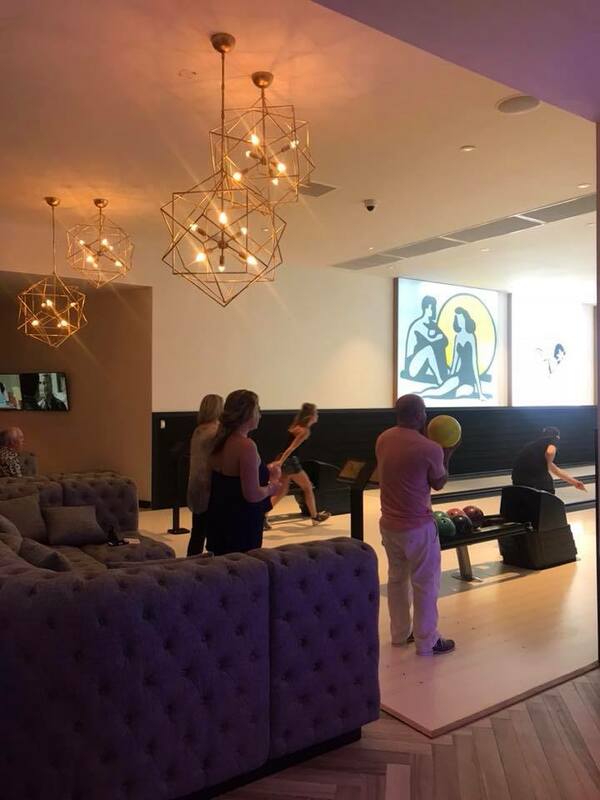 Lover's Lane bowling is open at odd hours, and they are always subject to change, so double check when you arrive to see what the current schedule is. After dinner guests come in to hang at the bar, listen to the live music at the lounge, or play games on the table screens. Because of that, there is a 30 minute limit for bowling and if people are waiting you'll have to move along after 30 minutes. If nobody is waiting, they'll let you keep playing. But thats for now. 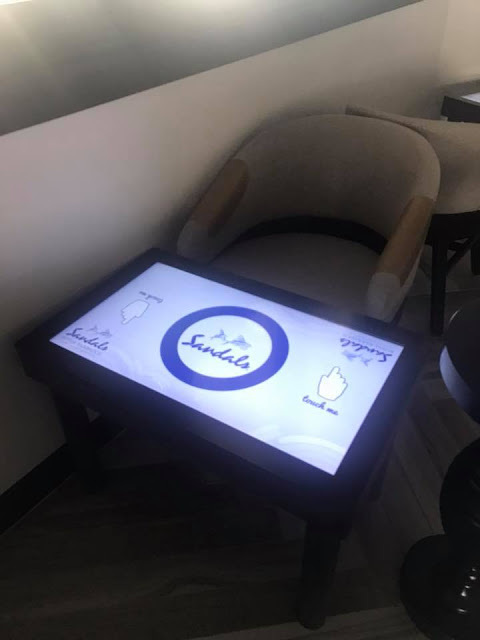 Soon the automated touch screens will be up and running and there will be a 30 minute limit on them regardless of a waiting list or not. But it's only fair as everyone will want a turn. 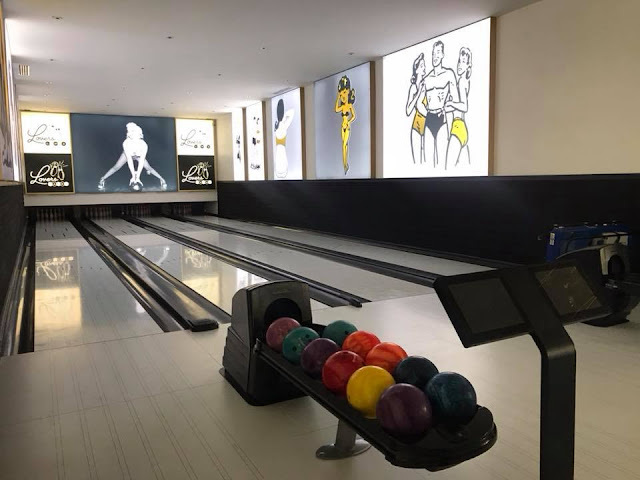 Butlers are able to reserve times to use the lane, so if you have a butler this is another great perk. 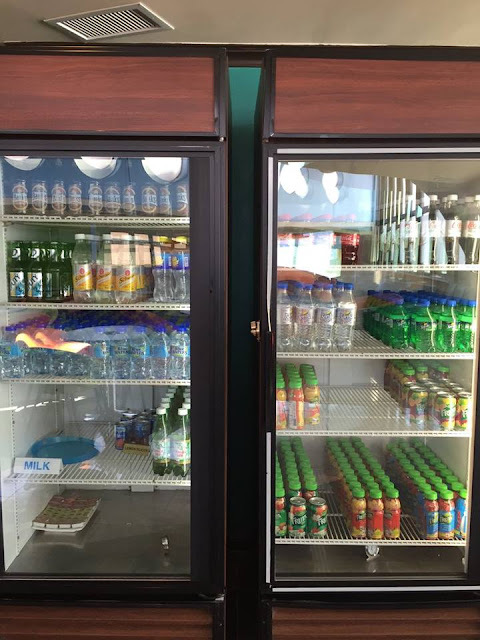 You can also order snacks here like chicken tenders, onion rings, or popcorn shrimp, and there is a bar inside as well. So this is definitely a fun place to hang out and you don't have to worry about what to do if you get hungry or thirsty. Sandals thought of everything already! Also, don't forget to bring socks! You can bowl in a dress (I did it, no problem) but you need to have socks. I ended up borrowing my husband's. Luckily, he takes very good care of his feet so that wasn't an awful thing, but some people I've mentioned this to since have said "ew, I'd never be able share my husband's socks" so that's something to keep in mind. LOL. 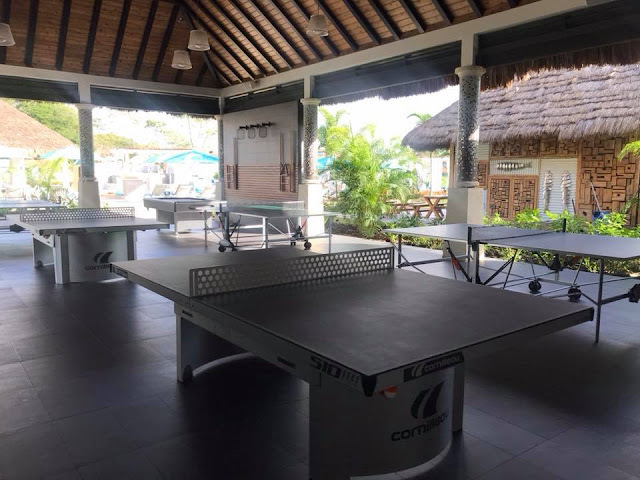 There is also an outdoor game area with games like table tennis and billiards, free for anyone to use as long as they're available and someone isn't already using them. No need to sign up or anything. If it's open, you can play. One of my other favorite features new to the Sandals brand is the outdoor lounge. 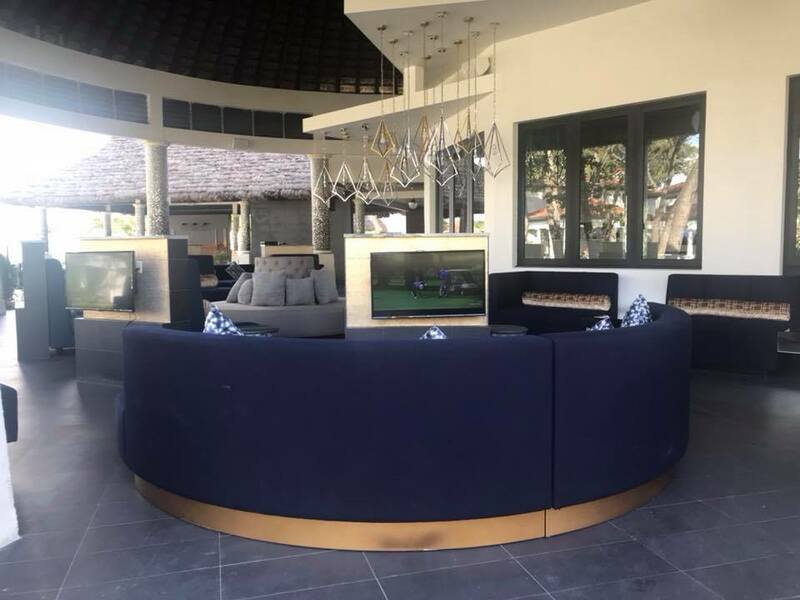 This area is outside of Lover's Lane and consists of several half circle couches facing TV's. In the evenings they'd put on different sports games and people would come sit down and watch. It's a genius idea since a lot of times at Sandals we'd walk into the pub and people would be watching the game there and some would be upset because it wasn't the game they wanted to watch. 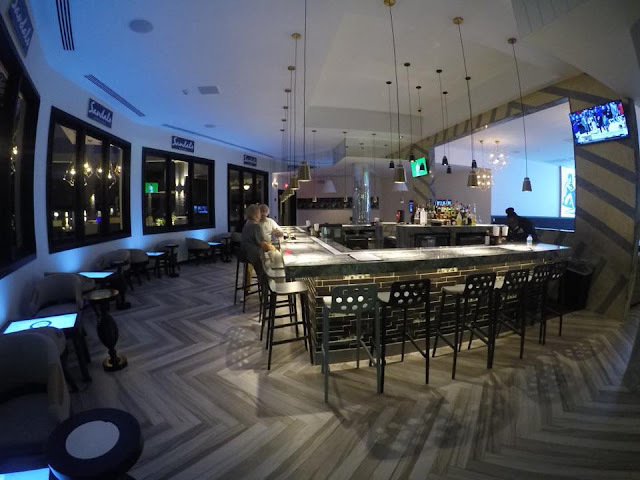 Now, there are plenty of options for places to watch various games. I walked by at one point and someone had put on Tom and Jerry and was watching that. 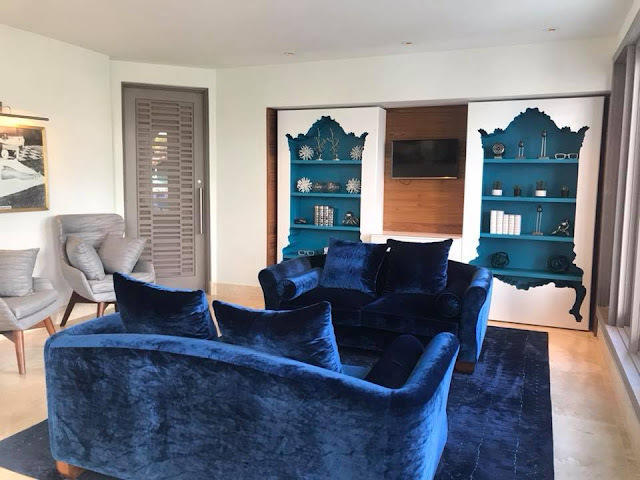 Lounge area outside of Lover's Lane with sofas and TV screens. 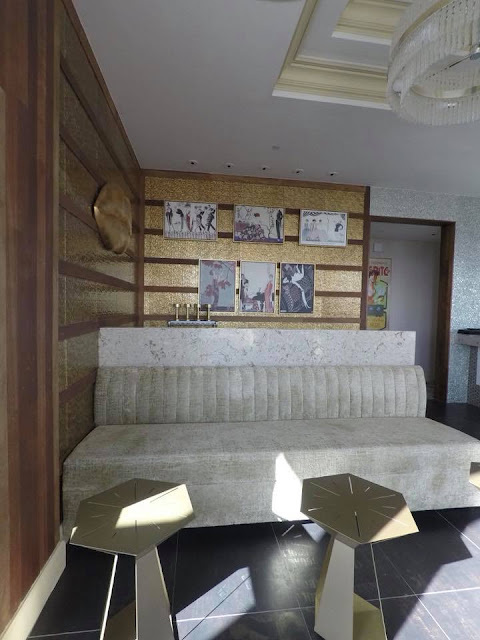 There is also a lounge area in the Lover's Lane building where they do live music at night. One evening a man was in their playing piano and the next evening it was a guy singing. 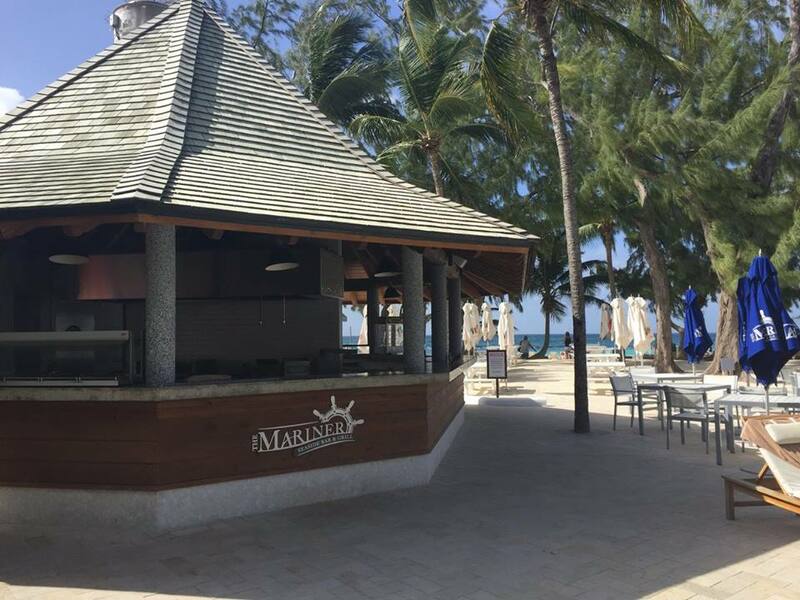 This is this resort's version of the "piano bar" found at other Sandals properties. Setting up for the live music. We didn't really hang around to check out any of the entertainment during our time there. But there is a main stage area where they were putting on live music and even did a movie night where they had a screen put up and they played a movie for whoever wanted to come sit and watch. The evening we saw the one lady singing the place was filling up fast and most people gravitated toward the fire pit area. How romantic to sit by the fire and listen to live music? I believe Sandals has plans to utilize that stage more as part of their L.I.V.E. promotions. 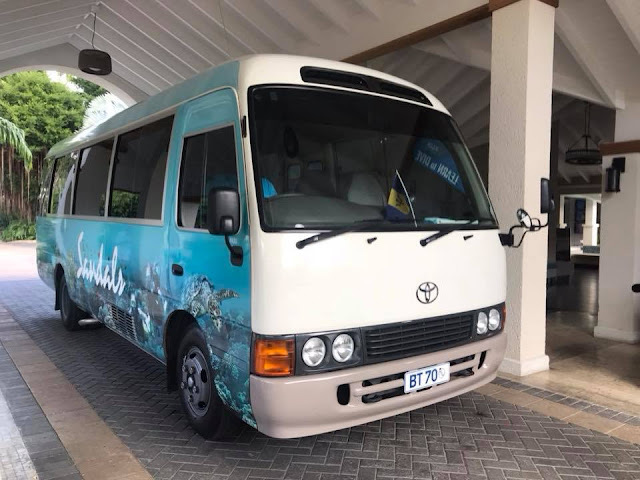 Since Sandals can't send their boat to pick up guests at the resort for the complimentary snorkeling excursions, they have a shuttle that takes you about 15 minutes into town (Bridgetown) to the harbor and they have an Aqua Center/Dive Shop there that they operate from. So when you sign up for the free resort snorkeling, you'll meet in the lobby and take the van over. If you plan to go for snorkeling or diving, the shop has items to buy such as snorkeling gear (like the full face masks), underwater cameras, t-shirts, hats, sunscreen, etc. Definitely bring some cash if you think you may want to buy some items there. I'm not 100% sure if you can charge it back to your room from there so check with the Watersports Desk when you sign up. 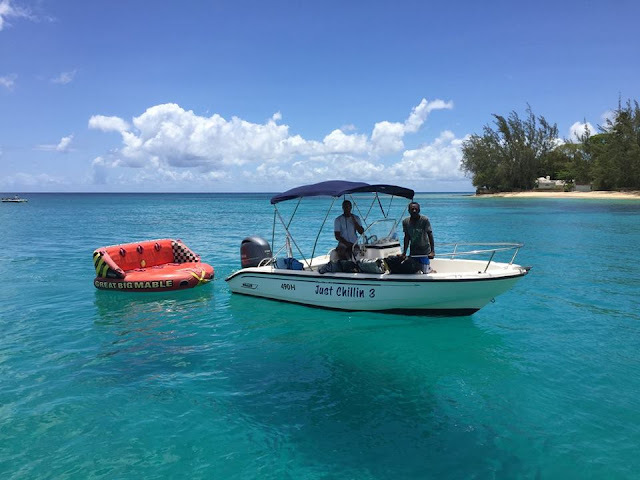 While this trip we stuck to only doing the complimentary excursion, last time we stayed at Sandals Barbados we did the Sun, Sand and Sea tour through Island Routes and it was incredible. I wish we had more time to have been able to do it again on this trip. Definitely next time though. 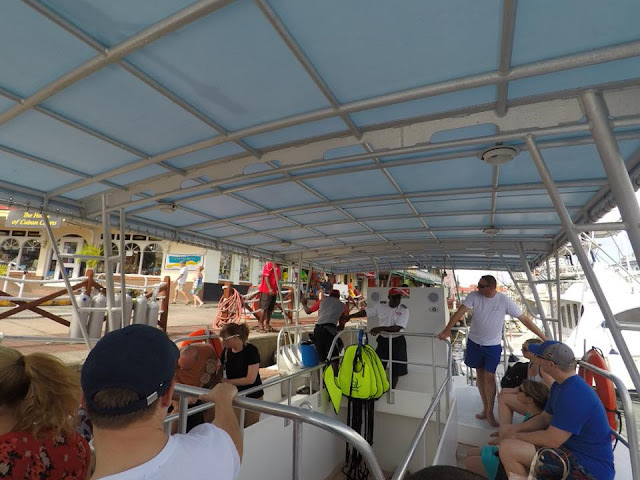 It's a luxury catamaran that they sail out to a snorkeling site. There is a sunken boat to explore and then they take you to a spot where the sea turtles frequent. 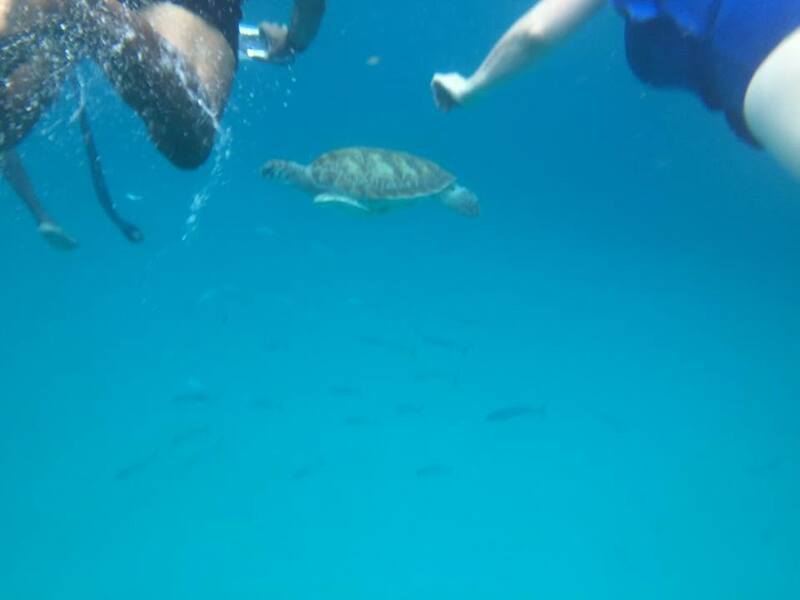 It was so amazing to be able to swim with the turtles there. 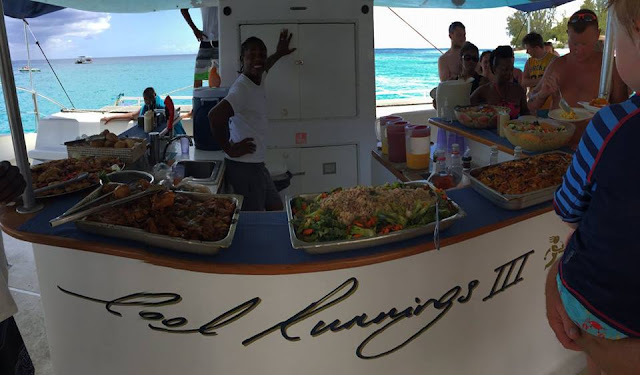 Then they pulled up to a secluded beach area and served us a yummy lunch. 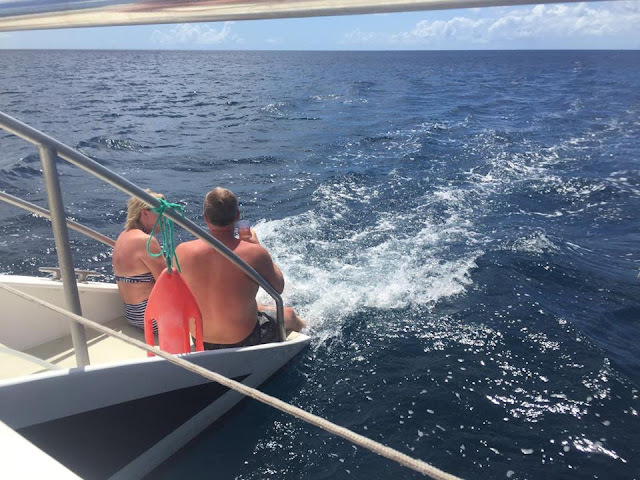 Pro tip, sit toward the back because they'll let you sit on the back step with your feet dangling in the water as you sail and it's so relaxing. Ryan, one of the guys on the boat, even gave us all little plastic sea turtles as a souvenir and reminder of what a fun day we had. I still have it on my desk two years later. Make sure to bring some extra cash to tip the guys. They do an awesome job and the tour is a lot of fun because of them. Amazing experience (wish I had a better photo but this was before I bought my new GoPro). Tubing was available (at an extra cost) if we wanted to do it. Red Lane Spa is available on property. That's the spa company for the resort chains. 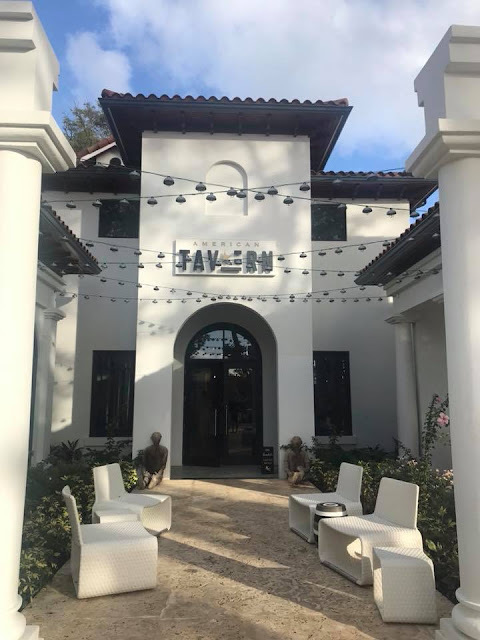 I didn't use the spa this trip, but I did get to tour it and it's beautiful. 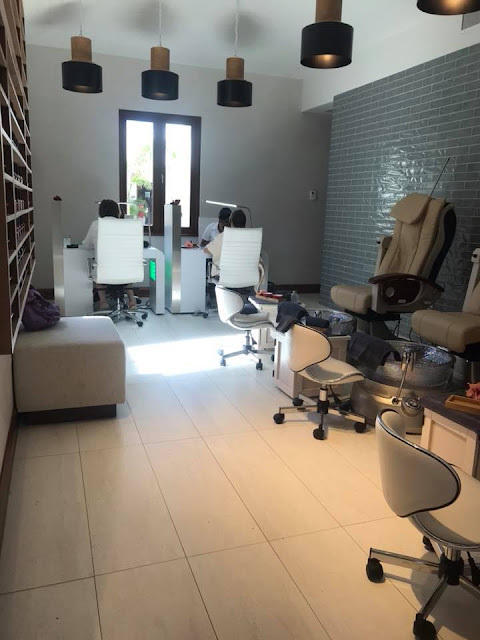 They have a nail salon, hair salon, massage and spa treatment rooms, a sauna and a steam room, and plunge pools. 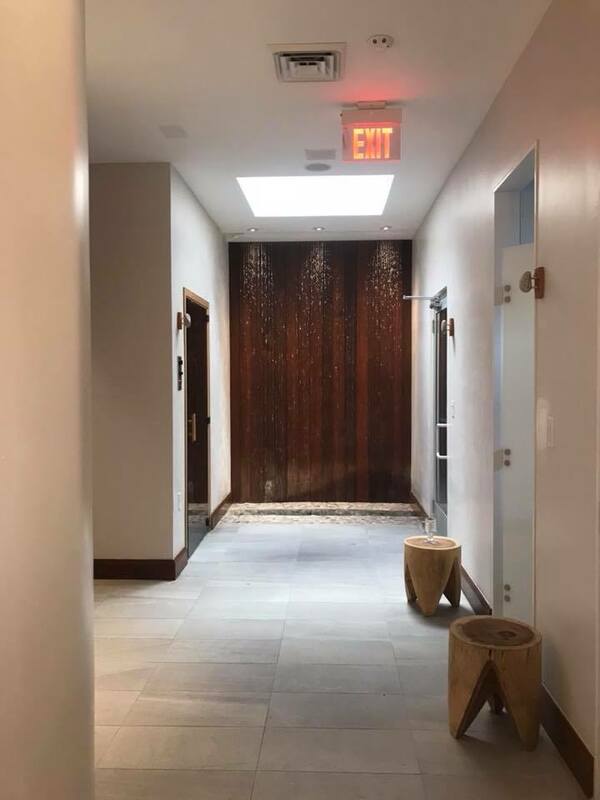 The sauna, steam room and plunge pools are open to all guests at the resort. Everything else is an additional charge. The Clip Yard is something I have to take a moment and highlight. I can't give my husband all the credit on this one as I'm sure many others asked for it too, but for years he's been telling me to tell various higher ups at Sandals that there should be an option at the spa for men to have a face shave. 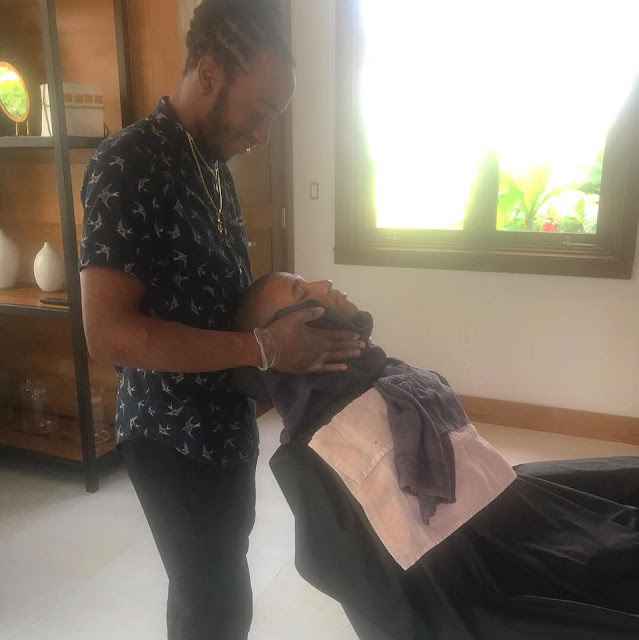 Women can go get their hair and nails done and he got tired of having to always travel with his razors so he could shave his face during the week and not look so scruffy. He wanted one of those relaxing hot towel face shaves, but none of the Red Lane Spas we went to were able to do that for him. Finally Sandals Royal Barbados announced they were introducing The Clip Yard, their first ever barber shop on a resort property. So naturally, my husband wanted to be one of the first to try it. I'll precursor this by saying it's brand new, so they have some kinks to work out and we knew that going in. 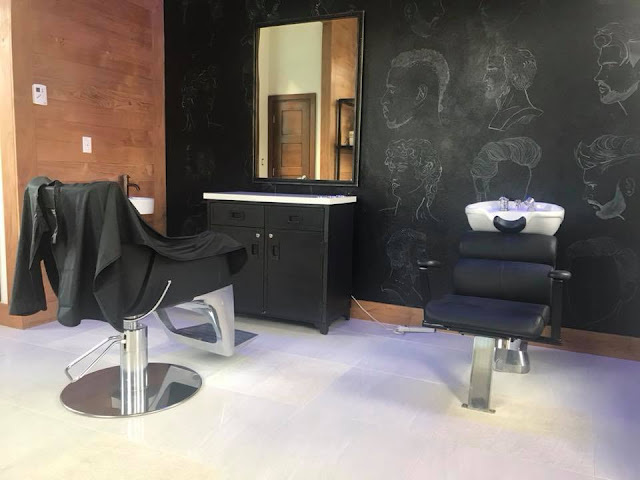 The barber is contracted out, so he isn't on property all the time. You'll have to make an appointment at the spa and they'll coordinate it with him. We made the appointment for Monday at 9am and received a call in our room that morning at 8:30am asking if we could move it to 9:30am, which we said was fine. 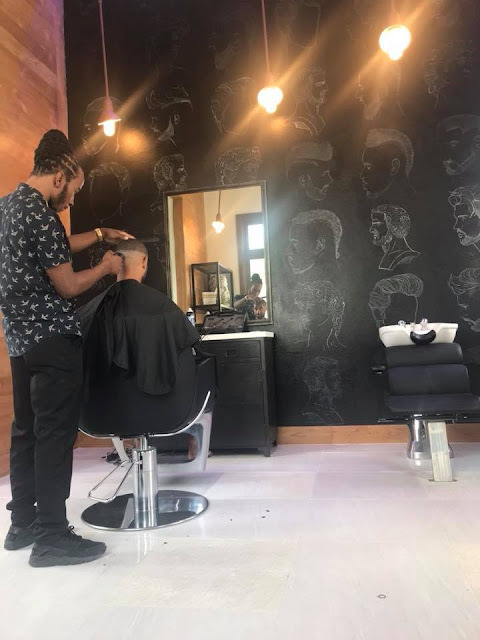 When we arrived at 9:15 (assuming he had some paperwork to fill out ahead of time) he filled it out quickly and we waited until 10am until the barber showed up. We were explained that it was some communication issues, and honestly, we were fine with it, but we would have preferred if they had just said "come at 10am" instead so we didn't rush through breakfast. But it was what it was. We're on vacation and have to remember to be patient and go with the flow with these sorts of things. The barber was very nice. He told us about the shop he works at off property and how he also does tattoos. My husband ended up having him do a hair cut and a face shave. The haircut was great. Nothing different than what he'd get at home. The face shave was a bit different than what he was expecting. Apparently the barber forgot to wet his hair before applying the shaving cream (canned shaving cream, not soap in case anyone is wondering) and so every time he went over the hairs with the blade it pulled at them as if someone was taking tweezers to his face. At one point the barber realized my husband had tears streaming down his face, a reaction he couldn't control from how much it was hurting him, and apologized. So next time, we'd make sure he wet his face first. He expected the barber to use the hot towel before shaving but they didn't have the hot towel machine in the room so halfway through the barber had to leave and bring the machine to the room. Again, it was probably one of the first shaves done, so they weren't 100% ready to go, but hopefully now they are. Other than that little blip, the room is set up was perfect. 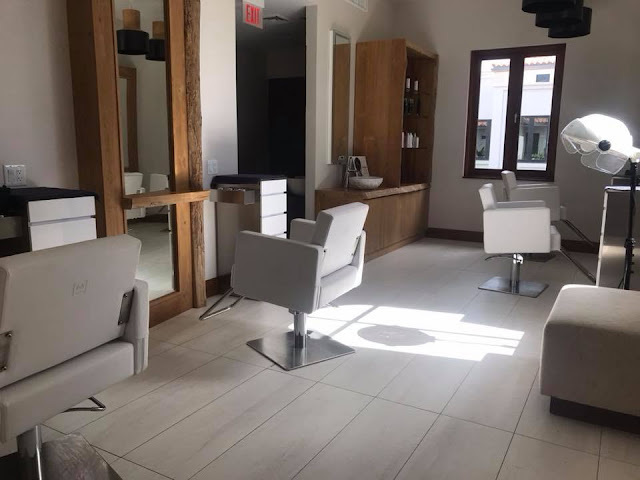 Just one chair and one sink and then two comfy seats for anyone waiting. They have a TV and music playing. 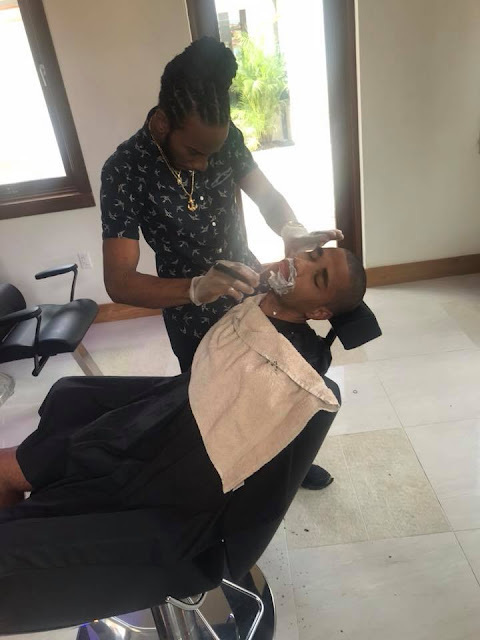 All in all, he said he'd definitely go back again, he's just be sure the guy doesn't rush and forget to wet his face first. In total the whole thing cost about $50 for the shave and haircut (not including tip) which we expected. It was more than what he would pay at home, but we knew we'd pay a little more being that we were at a resort. This resort has some pretty incredible pool options. 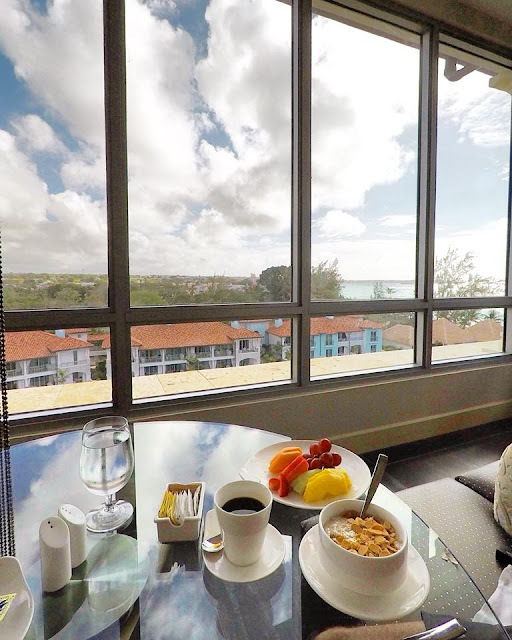 First and foremost, the rooftop pool and hot tub which overlooks the beach, ocean, and resort. Then there is the Infinity Pool by the beach. This becomes the hang out spot during the day. There isn't a swim up bar here but there is pool bar service and wait staff comes around regularly asking what you'd like to drink. 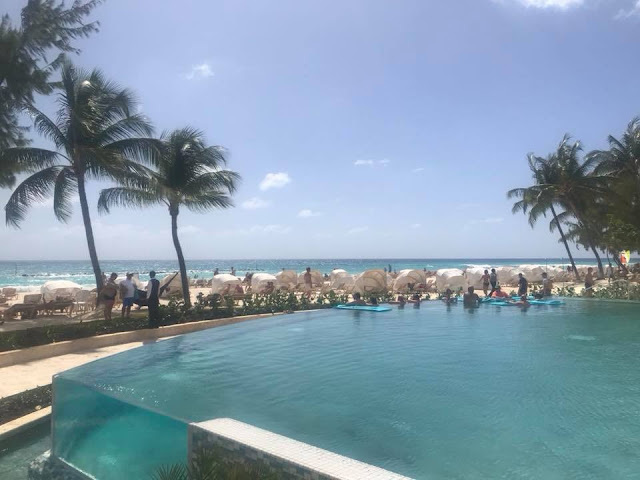 It's funny to walk by and see everyone hanging out at the end of the infinity pool because you can clearly see their bodies in the water and the optical illusion makes it look like their bottom half isn't connected to the top half. I love these by the infinity pool desk which aren't just water features, they're where you can dip your feet to clean the sand off. 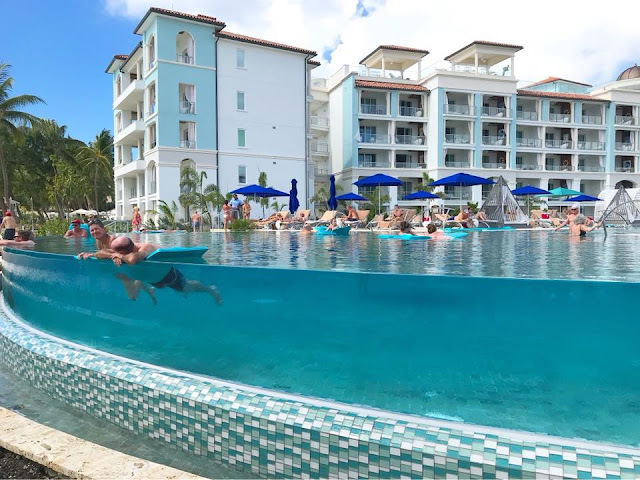 The pool area over by the Jerk Shack is a bit more lively during the day. They have a DJ that plays music and they have the swim up bar here. The loungers around the pools are a bit more cushioned than the beach loungers. The resort was at around 93% capacity when we stayed and we had no problem getting a lounger. The pool guy even set it up for us with towels. 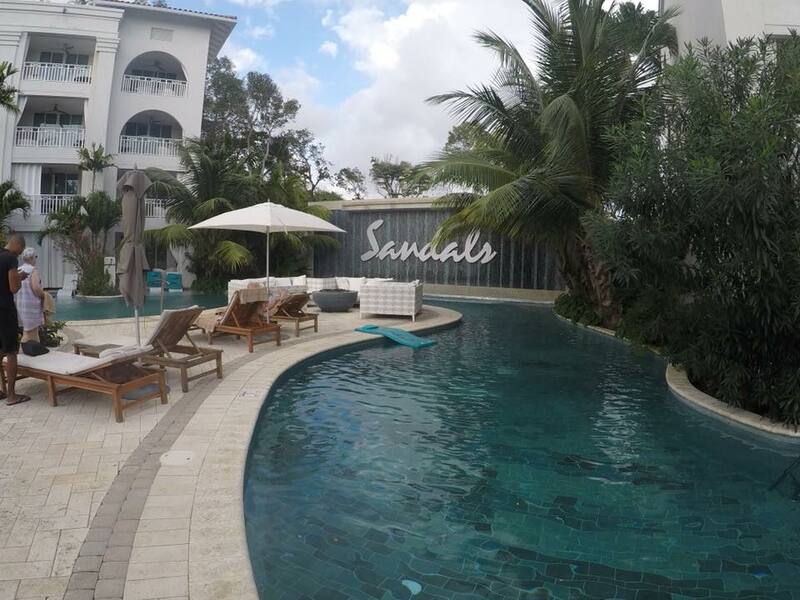 On the Sandals Barbados side you also have several pool options. There is the main pool area which is the most active. 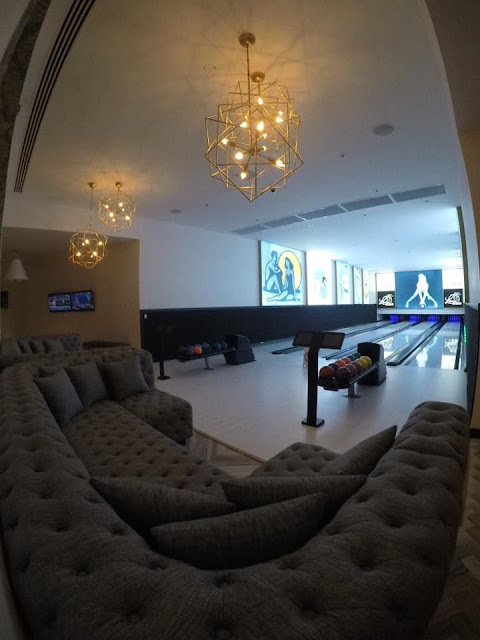 This is where they have music, pool volleyball and games going on. There is also a beachfront hot tub, too. 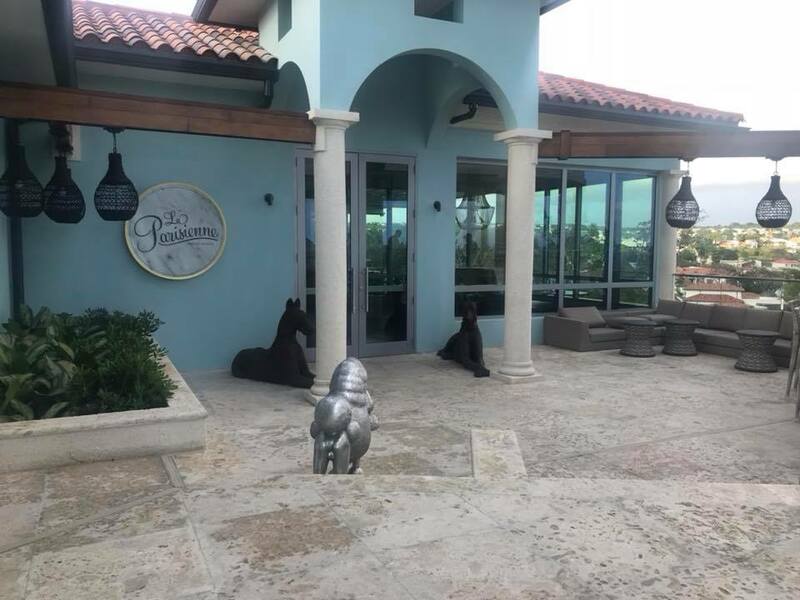 You'll also find the quiet pool on the other side of the building, right in front of Portifino's and near Cafe de Paris. 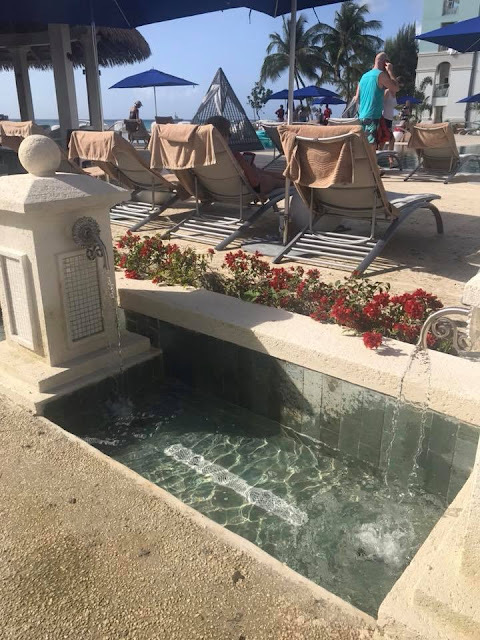 Of course there is also the lagoon pool set back by the lobby at Sandals Barbados. Most people don't realize this pool is open to all guests. You don't have to be staying in one of the swim up suites. There is a section where you can float around by the Sandals sign and aren't in the way of any of the swim up rooms. We like to come back here in the late afternoon and float around in the shade of the palm trees when we've had too much sun all day. 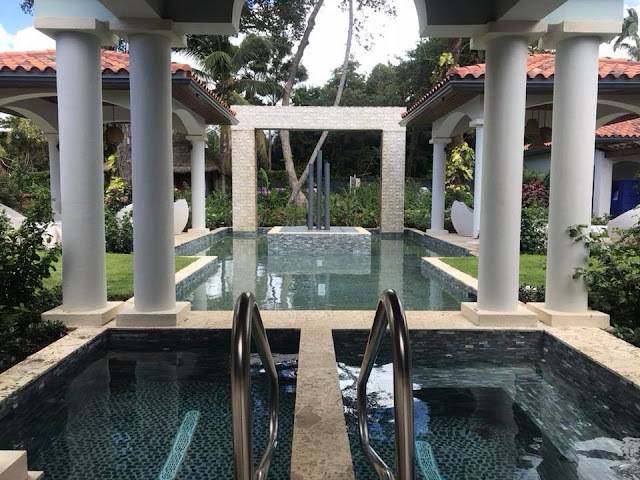 But if you're one of the lucky few who has your own private plunge pool, or a swim up suite, you have that as an option for swimming, too! Here are some of the new swim-up suites. Or you can be entirely unique and book a room that is on the top floors but still has a private plunge pool over looking the beach! 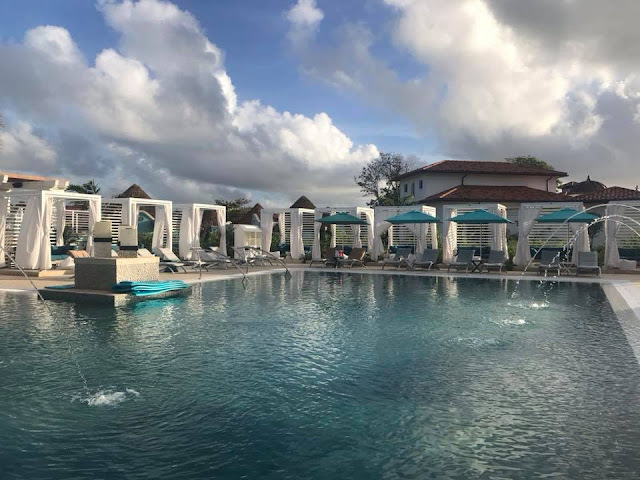 One of the common complaints I have noticed people saying about the pools is that there aren't enough lounge chairs because people wake up extra early and reserve them all, or the butlers reserve them for butler guests. Personally, I didn't find it to be an issue finding chairs. 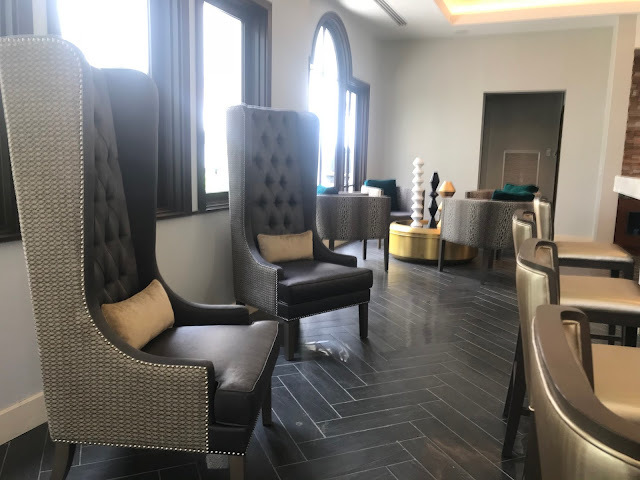 My husband went down one morning just to scope things out and he said by 6:30am many of the butlers had reserved the best chairs (in terms of views or locations) and many guests had already begun leaving items on chairs to claim them. Sandals has a rule where if by 10am you aren't at your chair, they're going to move your stuff and make space for someone else to use it. We like to enjoy our mornings at our leisure and not rush to make sure we get to our spot by 10am, so we never held any spaces. We arrived around 10 or 11am in the morning and found chairs no problem. Most of the time we just needed a place to drop our things so we could get in the pool and then when we got out we wanted to lay in the sun to dry off or tan anyway, so shade wasn't a huge issue. However, once I started burning, I did start looking for more shaded areas and that meant that hanging out at the Rooftop Pool wasn't the best location (no real shade up there), or laying by the Infinity Pool where shade was limited probably wasn't the best idea. So we would go to the pool over by the Jerk Shack and never had a problem finding a chair with an umbrella over it. Plus, that pool had the swim up bar and DJ playing music, which we enjoyed. There are so many pools to choose from so you won't ever have an issue finding a chair somewhere. The Infinity Pool gets sun most of the day but by the afternoon the sun goes behind the building and everything is shaded, so if you're in need of shade but want to hang out at that pool, do it in the late afternoon when the sun won't bother you as much. 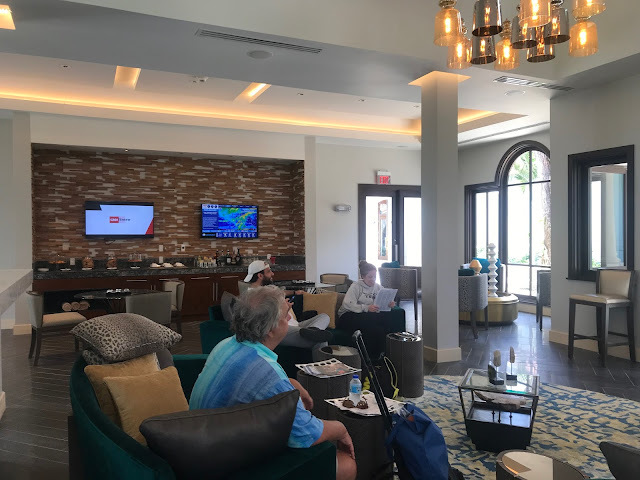 Also, one thing I quickly learned, the pool staff goes around and puts towels down to get the chairs set up for guests, but if there are only towels down and no personal items like sun glasses, flip flops, sun tan lotion, books/magazines, etc then those chairs are technically free to any guests. We made the mistake of thinking the chairs were all taken at first until the pool guy explained he was just setting the chairs up with towels for all the guests and they weren't reserved or anything. 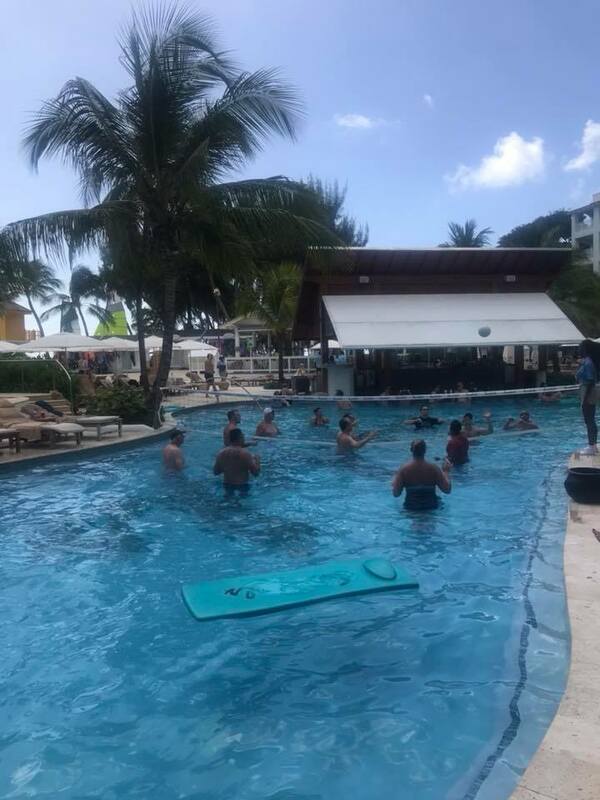 And many people were leaving their wet towels behind when they left the pool or beach for the day, so it was hard to know if they were gone for good or coming back. I always take my towel with me and drop it in the bin so the next person knows my chairs are available for them to use. 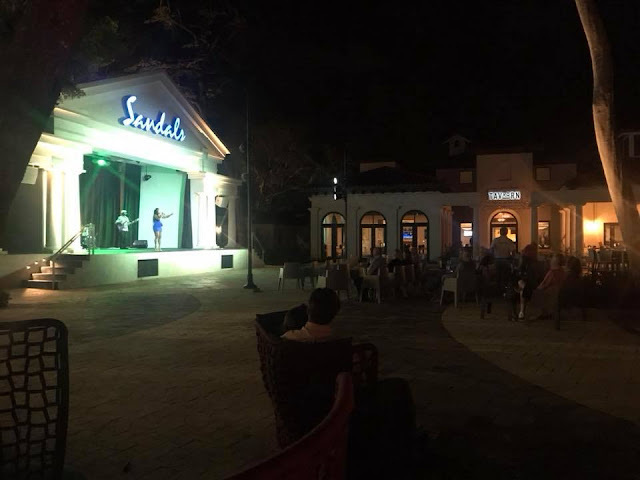 The first time I went to Sandals Barbados, I didn't go in the ocean at the resort once. The waves looked kind of rough and I wasn't sure if I wanted to be knocked around in there. I enjoy being in calm, clear, water. But this time I saw there were a lot of people in the water and the sun was out and the water looked clear and not too deep, so I went in and I'm so glad I did. I always said the one and only downside to this resort was the ocean was rough, but I don't feel that way anymore. I think when they added more rocks as a barrier it helped and now that the new resort is open the water is much calmer than it was a few years back. Once you get past where the waves break the water is really nice. It was cool, but a perfect temperature for my sun burn. No rocks or seaweed, just soft sand beneath your feet. It wasn't deep either. For the most part it was waist deep until you go to some parts where it came up to my chest. Then when a wave came by I'd have to jump or it would hit me in the face. Plus, the waves were fun to play in. I saw some couples with boogie boards riding the waves into the beach and they were having a blast. Once I was in the water I honestly didn't want to get out. My husband kept telling me "we should go get ready for dinner" and I'd say "Okay, five more minutes". I would have given up dinner that night had he not persisted. Something to note, I know the problem of butlers reserving chairs on the beach worries some people, but honestly, we didn't have an issue finding a beach chair either. Yes, sometimes the spots we would have preferred better were already taken, but we still found empty chairs without issue. 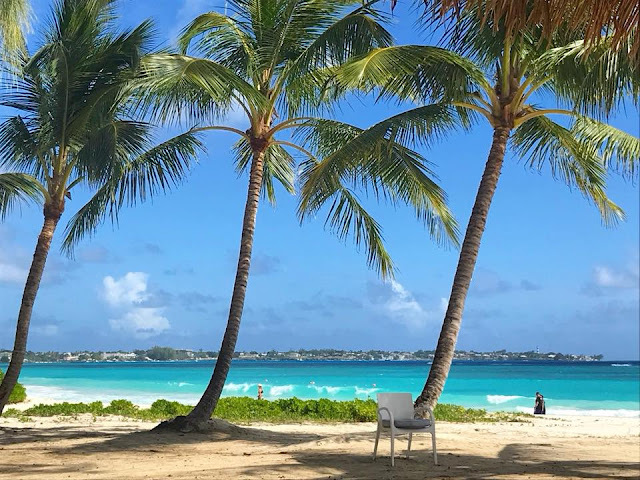 If you plan on actually laying out on the beach and need the shade, there are options and you can ask the beach staff to help you find a shaded lounger, or move a lounger over to where the palm trees shade the beach. Over by the Sandals Barbados side there is a lot more natural shade. The General Manager did mention to us that they would be bringing in more of the cabanas (the white lounger covers). 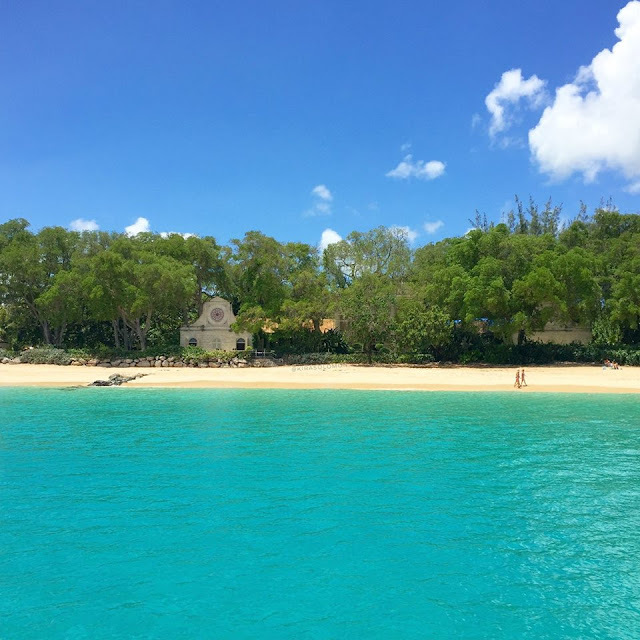 There are currently no plans to add palapas or cabana beds, like they have at other Sandals properties, to the beach. This is mainly because the government is very strict about putting in anything on the beach that is considered a permanent structure. They had to jump through tons of hoops and fees just to move the yellow lifeguard stand from the middle of the property to the far side since that was government owned. Which, reminds me, something cool about Barbados is that there is a lifeguard for the beach. The yellow structure is their stand and they are government employees, so you have that added sense of safety while swimming. 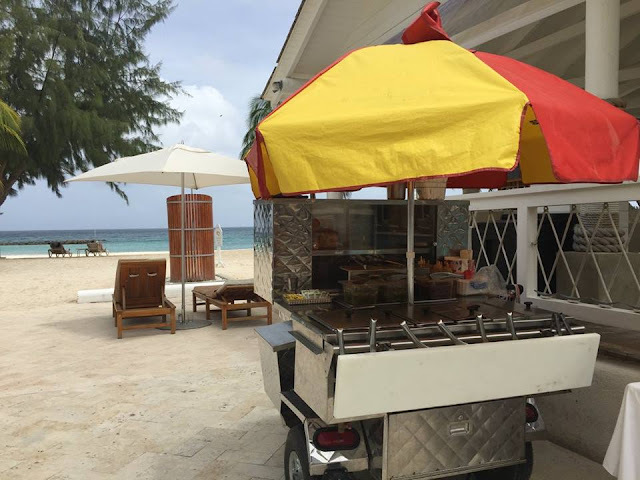 There are also vendors that walk the beach but Sandals owns up to a certain property line and there are signs saying vendors can't go beyond those signs. Some of the beach chairs are behind that sign and others are in front of it. We put our stuff down in front of the signs and no vendors or locals bothered our stuff or us. In fact, no vendors even came to talk to us or try and sell us any tours or anything. I didn't even realize there were outside vendors even on the beach until I saw the signs. 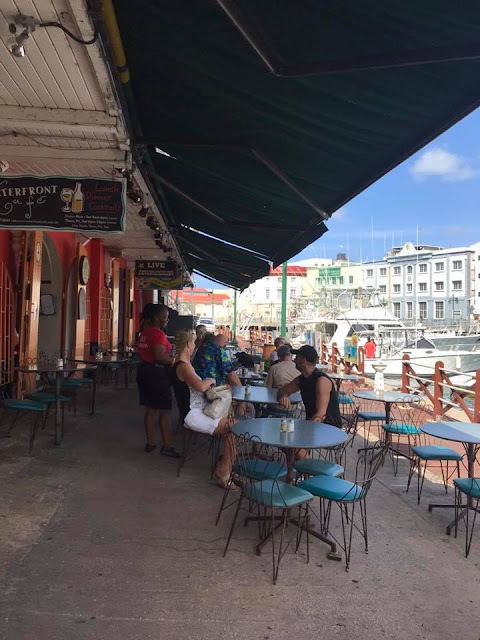 All that being said, in Barbados it's a little bit different, which is why there is some confusion about this. 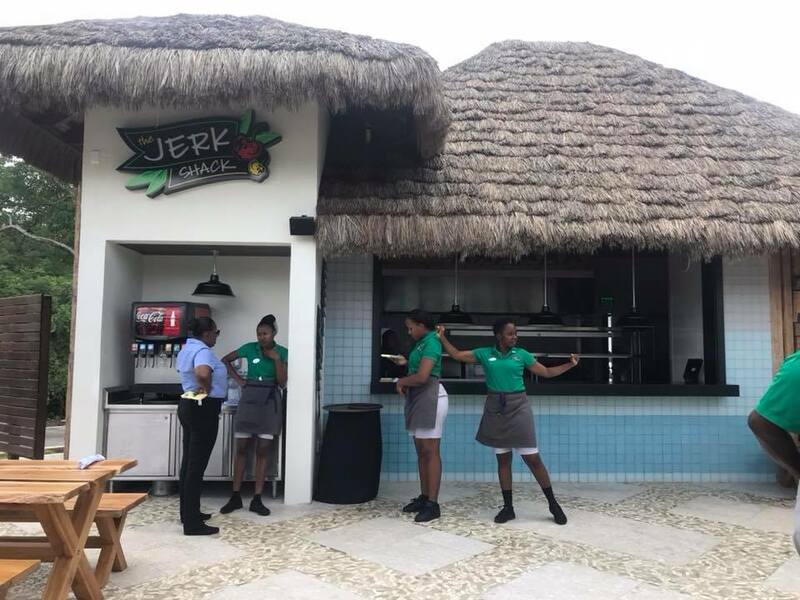 There are pretty strict labor laws in Barbados and the Labor Union and the government have laws in place that protect workers from losing their jobs over things like this. 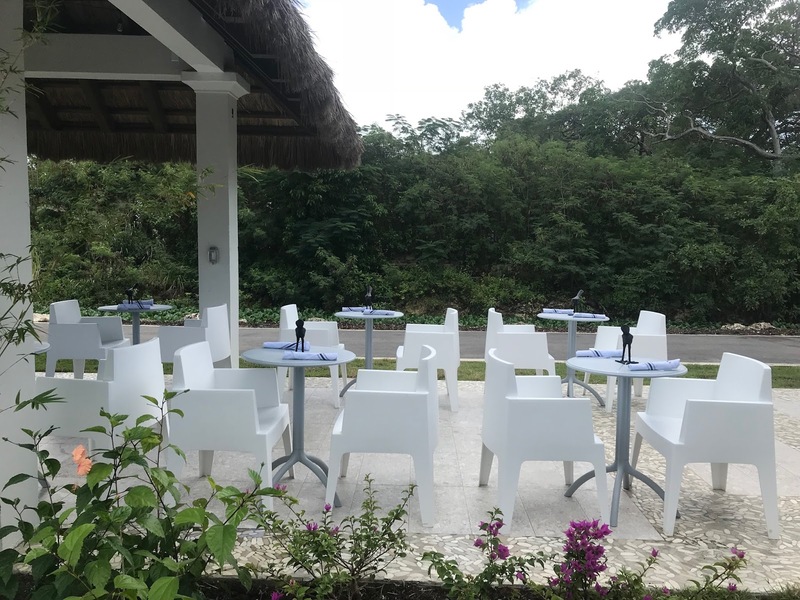 On this particular island, if a staff member is caught accepting tips, they likely won't be in jeopardy of losing their job over it, like on other islands. But, it's still technically not allowed since that is the Sandals policy and you've already pre-paid all of those gratuities. Leaving Sandals is always the worst! But, alas, our trip was over. Our flight left at 7:30am so check-out for us was at 4am. That was awful. We got the reminder slip under our door two days earlier with the check out information, and the final bill (since we charged the Clip Yard cut and shave to the room). Then at 4am that morning we walked down and checked out. Not my favorite thing to do. 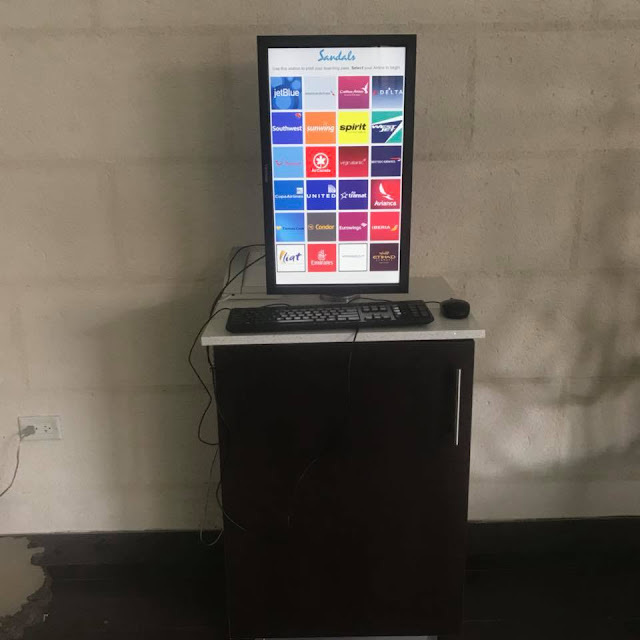 There is a computer in the Sandals Barbados lobby that you can use to securely check-in for your flight ahead of time, but I don't believe you can print the tickets from there, which would have been nice since we don't check bags and like to go straight to security. But, it's nice they have this in the lobby for guests, and that it's secure. As soon as you check-in to your flight and get the confirmation all the information disappears and can't be brought back up by the next guests. On this stay, we didn't bother with the VIP airport service because we knew we were coming in late and leaving too early to be able to really utilize it. But we did get it on our last trip and after comparing the two times, I would definitely opt to get it again for both arrival and departure. The long lines on arrival can be brutal and on departure, the seats at the airport aren't the greatest, and food can be expensive if you need to eat. 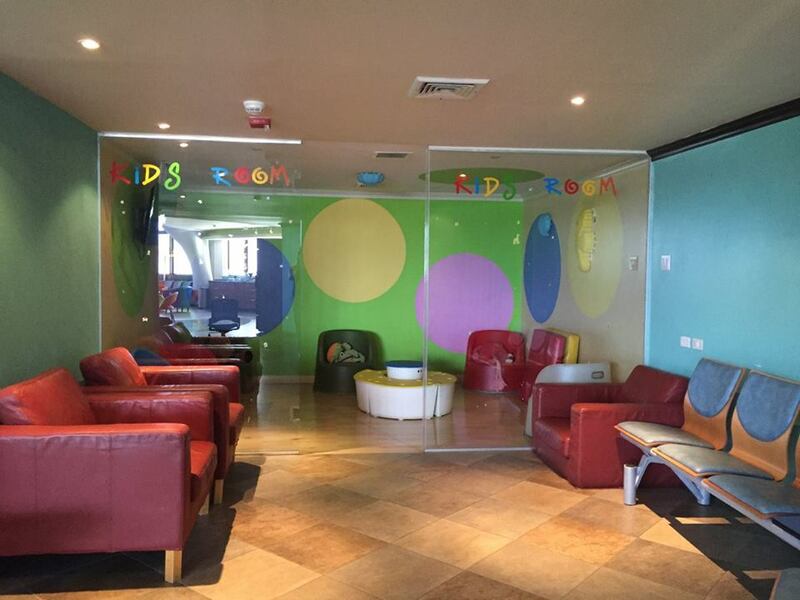 My recommendation would be to get the lounge if you want comfort or if you're traveling with kids who may not do well sitting around the airport. The lounge as leather couches, comfy chairs and tables, a "kids zone", food, drinks, TVs, and a view of the runway. The cost for departure service is currently $29.99 per person (subject to change at any time). If you want to book this, let your travel agent know and they can set it up for you. 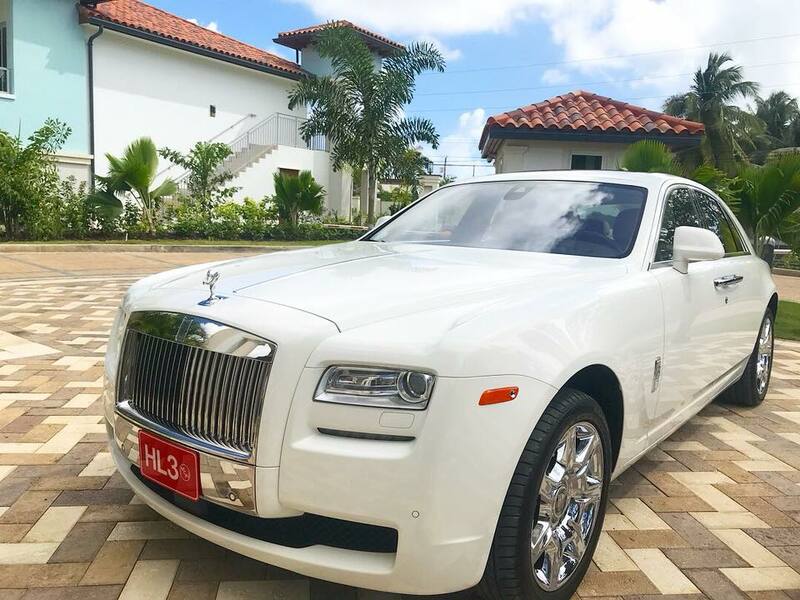 You can also use this service to set up private luxury transfers if you're not in a butler category that already has them and you'd like them. One thing to beware of in case it happens to you... when the ticket agent handed me my ticket it had a big SSSS printed on it. For those who don't travel often, you may never have been blessed with the opportunity of having SSSS printed on your ticket. What it means is "Secondary Security Screening Selection". This means you've been given the honor of being "randomly selected" for additional security screening. The worst part was that I wasn't allowed to even go back inside and sit with my husband who hadn't been paying attention when I left and I could see through the window was now frantically trying to figure out where I had disappeared to. They wouldn't even send someone to go tell him where I had gone. Luckily, he saw me through the window finally and we were able to communicate with hand signals for the remainder of the wait to board (I'm not even kidding about that since I had no Wifi service out there lol). Also, when it came time to board, we were extra leg room on JetBlue and boarded first and the lovely lady who got way too handsy with me almost refused to let me go until my husband got someone to finally explained to her I was part of the first group to board. So, moral of that story is- if you buy the fast track pass and end up in the departure lounge area- you need to pay attention to several things - 1) Know what time you're boarding and leave so you make it to your gate in time, because they don't make announcements in the lounge (at least they didn't when we were there). 2) Make sure you don't have SSSS on your boarding pass. If you do, make sure to arrive to the gate with plenty of time to go through that lovely experience, or else they may have to hold up the plane waiting for you to go through it. 3) If you do get stuck in the "holding pen" let your significant other know so they don't wonder what happened to you. 4) If you're in the pen, pay attention to boarding announcements and make sure you don't miss when thy call you for boarding because you won't hear any of the announcements from there. All that being said, it was a wonderful trip experience. There were some hiccups along the way, but none of that would ever make me not want to return. Like I said before, these were all little "growing pains" and considering the resort is only a month old, I was highly impressed with how smooth things were actually running. The water is that perfect shade of blue and soft powder sand. The rooms are beautiful no matter what category you're in. The food (despite a few issues here and there) was delicious - we never ran out of options or found ourselves still hungry at the end of the night. 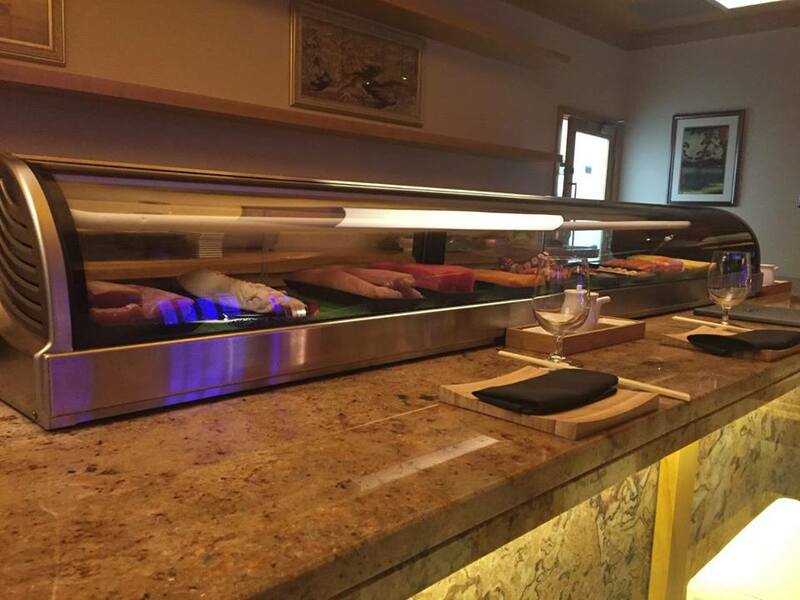 Service (while again we had a few minor issues with a few employees) was excellent. There were plenty of things to do on and off property. The island feels safe and welcoming when you leave property. I happily recommend the resort to my clients and future client. This resort is beautiful and quickly became one of my top five favorites. I'm already itching to get back there and hopefully bring others with me next time! 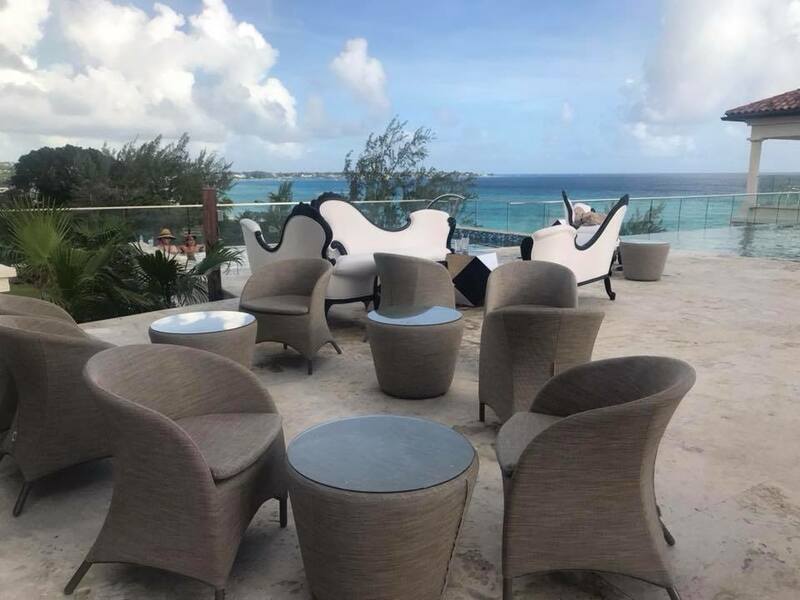 I'm even more excited for the opening of the new Beaches Barbados which hasn't been announced yet, but is in the works. Construction begins this year and I am very excited for that. We're long overdue for a new Beaches property and Barbados is an incredible island so it's a match made in heaven in my opinion. My final advise is... Go. Have an amazing time. 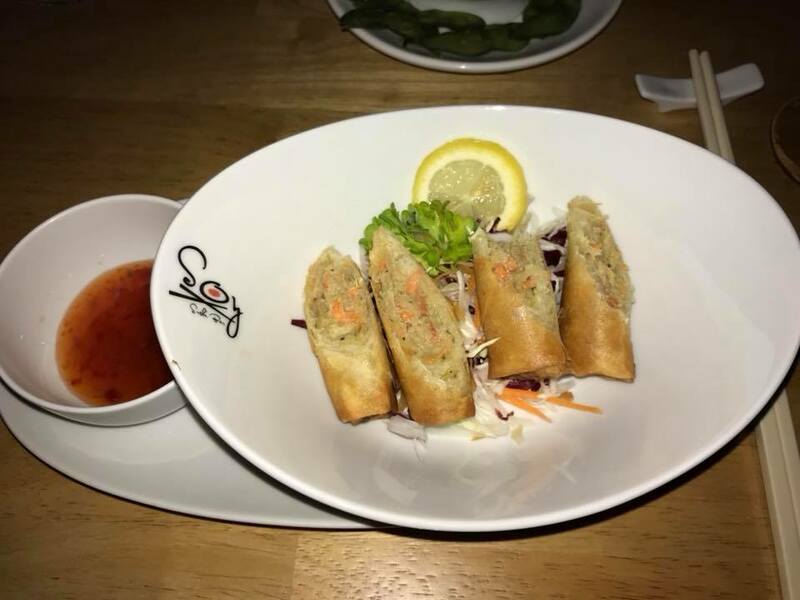 Eat until you're so full you can't move. Drink until you reach your limit. 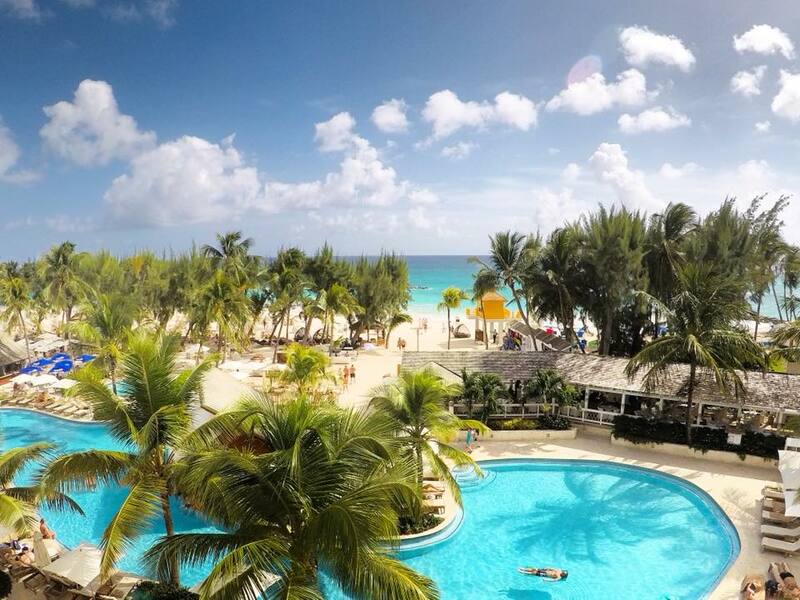 Soak up as much of that Bajan sun and sea as you can. 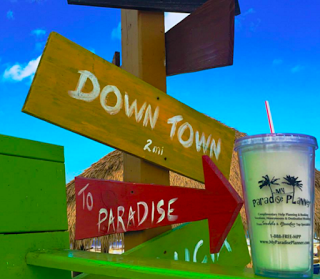 Don't let the little things stress you too much, you're in paradise! 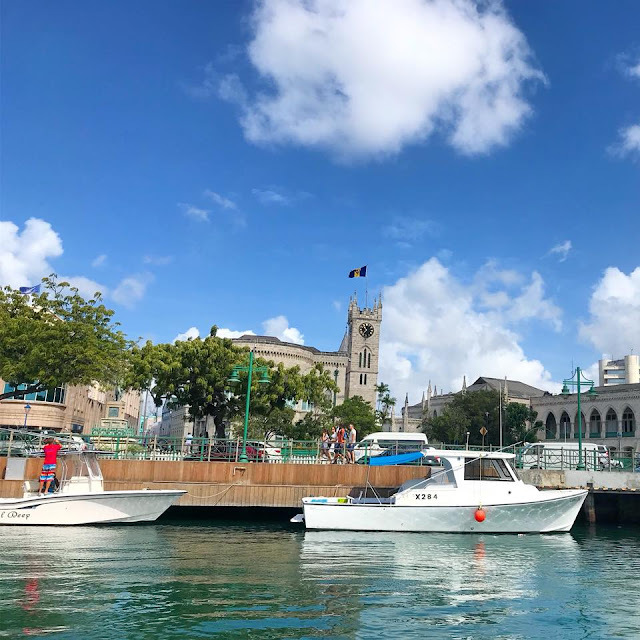 Talk to locals and get to know the history of this beautiful island and it's people. Take a moment to sit outside at night and listen to the tree frogs sing, you'll miss that sound so much when you get home. Enjoy every moment of it all, because a week goes by too fast and before you know it you're flying away from this beautiful island and frantically searching your calendar to see how quickly you can get back.